The following are the return to school dates. 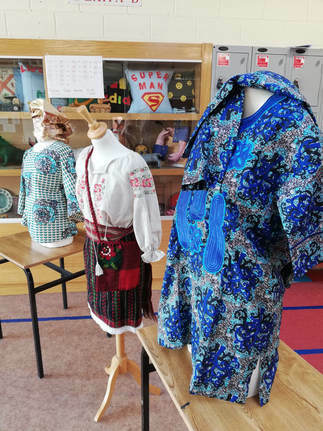 The Parents of St. Conleth's Community College have been working on their sewing project since October 2017 under the careful guidance of Fashion Designer Liadain Butler. They have designed wonderful garments and a magnificent backdrop, representing all the differernt nationalities in the school. 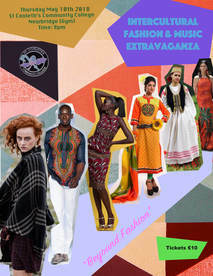 It is hoped that, in the first school term of 2018, that there will be an International Fashion Extravaganza, representing all nationalities, displying designs from all countries. Please click on the following links if you require reading lists for either Social Care or Pre-Nursing for the academic year 2018/2019. 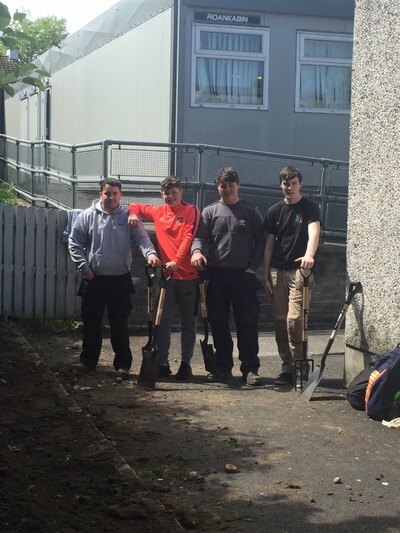 Well Done to LCA 1 who completed the first phase of our Community Garden. 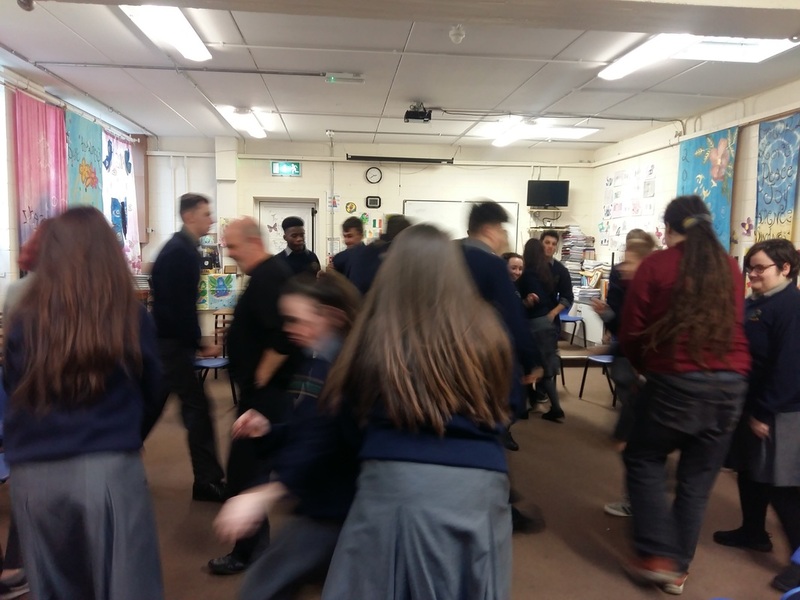 This is a STEM Education Project which is part of an European Project, “Open Schools for Open Societies”(OSOS), led in Ireland by CASTeL researchers. Open Schools for Open societies project will support our school in Implementing an engaging learning environment while drawing upon local expertise and experience. The LCA class researched, designed and planned what was going in the designated garden area. 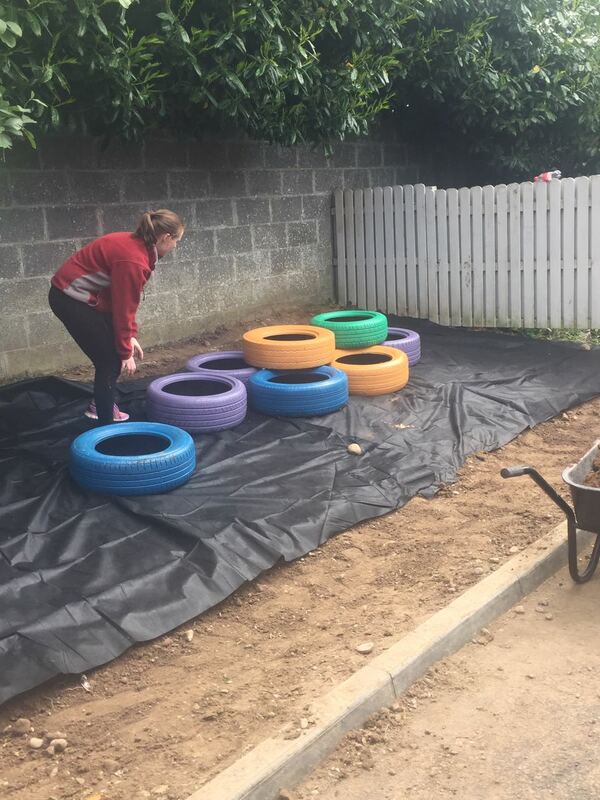 On Thursday 17th May, one group of LCA students dug and levelled the ground and added top soil while another group washed and painted the tyres and chair. The tyres were put in place and top soil was added ready for planting. A range of flowers from fuchsia to begonias to Lillie’s were planted. 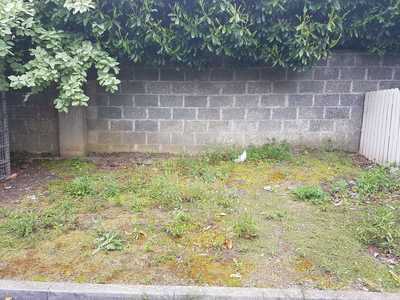 The garden was finished off with Bark to keep the weeds at bay. Mr Denis Godoroja from Bank of Ireland presented Chloe Geoghegan, Caoimhe Gately, Ernesto Gayahan and Damisi Odunuga with certificates in recognition of their work running the school bank over the course of the year. 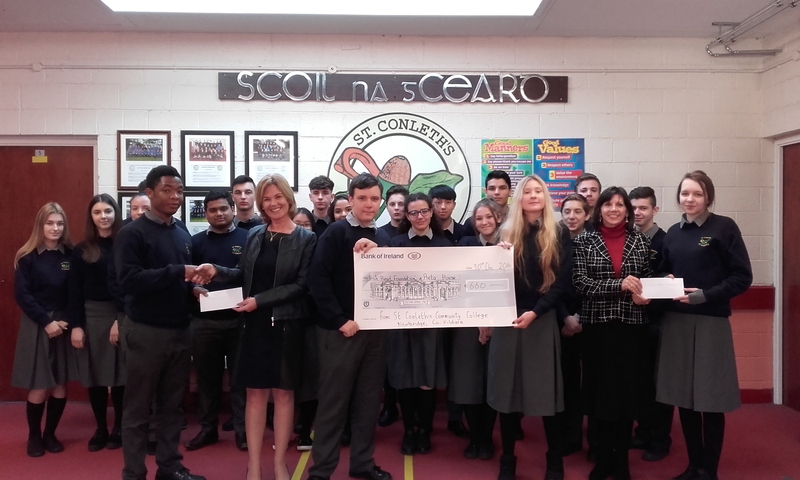 The students also accepted a cheque for €250 presented by ​Bank of Ireland. Mr Brian Daly was also in attendance and he was presented with a cheque on behalf of the Transition Year class by Naoise Booth. 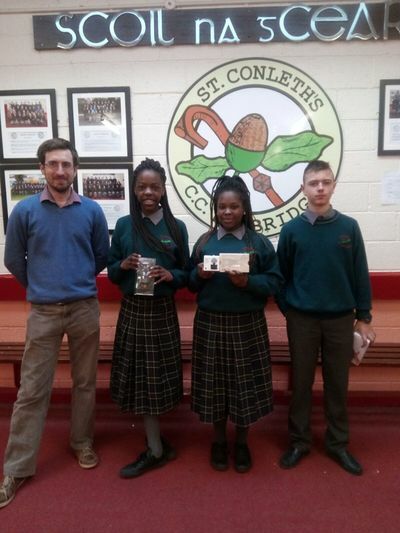 The students raised €872.50 for the Swim A Mile With A Smile challenge which they completed last month. The money raised will provide much needed funding for Our Lady's Children's Hospital in Crumlin and the Barrettstown Camp in Co Kildare. 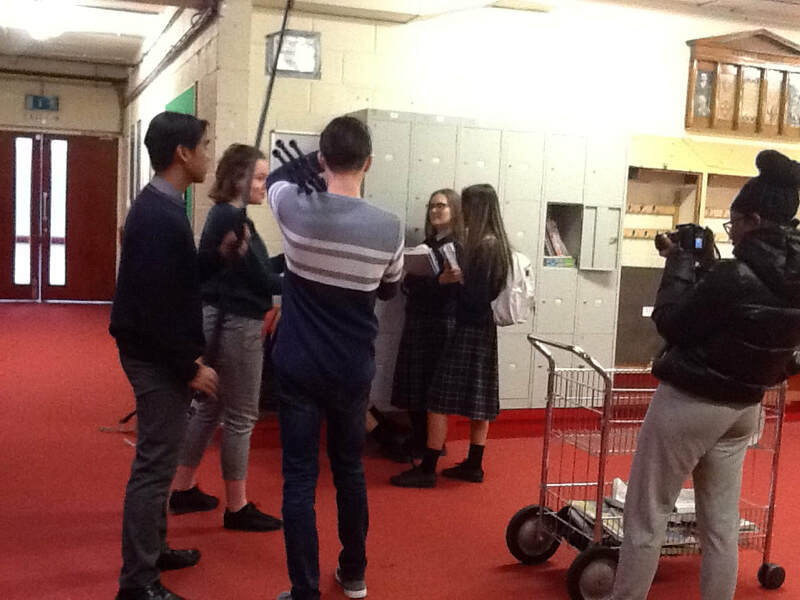 The students also provided a sneak preview of their Transition Year film - The Rhythm of Time directed by Damian Dykowski (5th Year). This was followed by a message all the way from south-east Asia from David O'Reilly, the location scout on various films like 'Fast & Furious 6', 'Charlie & The Chocolate Factory' and 'The Dark Knight Rises'. David praised the students' work wished them well with the rest of their filming. The following is a reminder to Parents and Guardians of 6th yr students apply to SUSI to complete the application form. The closing date for SUSI applications is July 12th. Sean, Chloe, Oliwia, Faith, Connor from 2 Red are completing their CSPE action project. Below is an account from the group on their project. "For our action project for the JC we made a poster about recycling. We chose a poster because it is the most effective ways to spread the word about water pollution. We have put our poster in the assembly area because a lot of people would walk by and notice the poster. The poster is about how much unrecycled plastic gets into the ocean. This water is ingested by animals and is making its way into the human food chain." 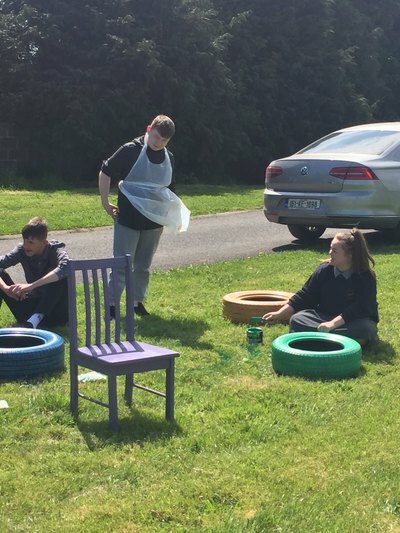 '​Congratulations to Fionn Hamilton, Diego Clavel, Julia Bulzacka, Eoin Swords and Joey King who under the guidance of Miss Kelly created a reflective drama piece on the Good Friday Agreement. The group were highly commended in the competition for their highly creative piece which the judges considered to be of a very high standard and exceptionally artistic. It is great to see performing arts at St Conleths CC is alive and well and the group look forward to more drama next year with Miss Kelly. 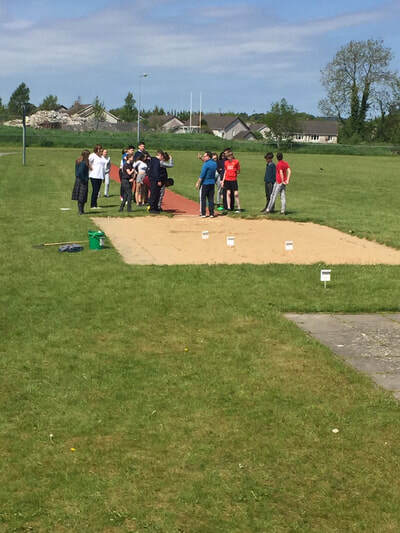 Today saw students and teachers making the most of the sunshine. 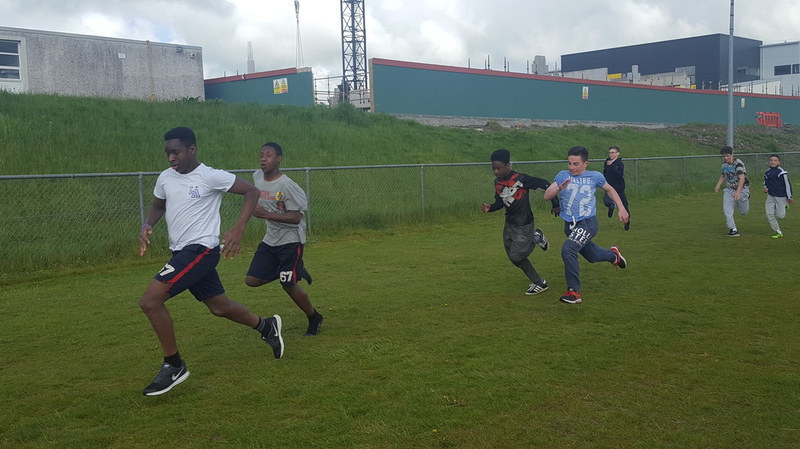 PE classes took to the track and field facilities. 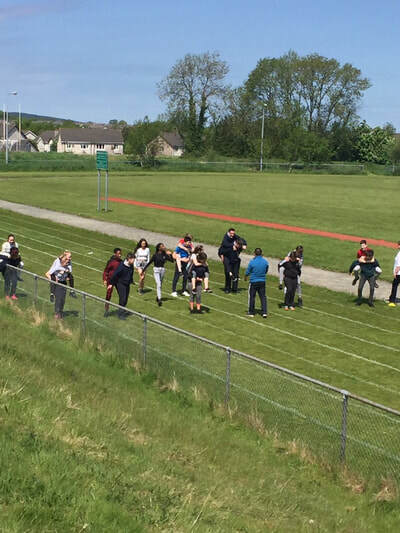 First years and Mr. Coleman had fun doing novelty races and the long jump. Mr. Whyte was working with 2C doing skills tests. Finally Ms. Hogan and the LCA1 class began work on the first phase of our school Community Garden Project. 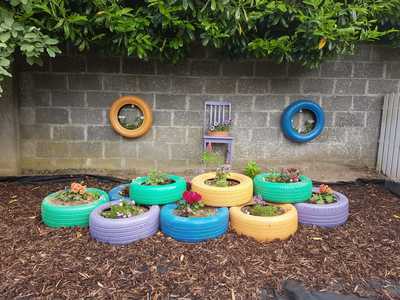 The class painted tyres and chairs to create a colourful flower bed in one area of the school. It was great to see everyone benefitting from the sunshine and having fun. 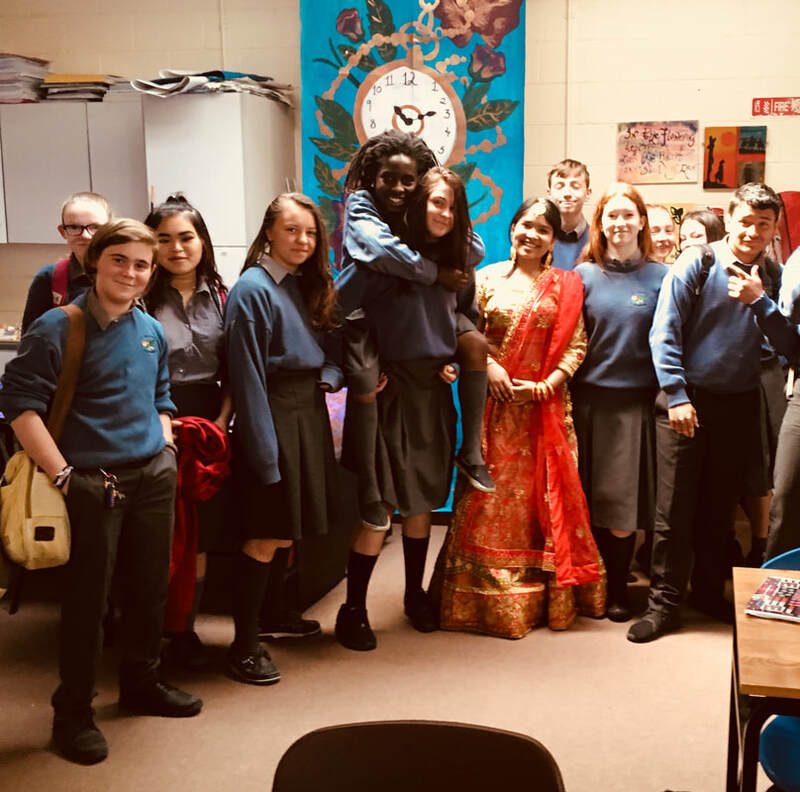 ​Over the last two years Miss Kelly’s current second year classes have been studying various World Religions, through cultural studies and the mediums of art music and drama. During this time,students have sampled various dishes from the world of Islam Judaism and Hinduism. 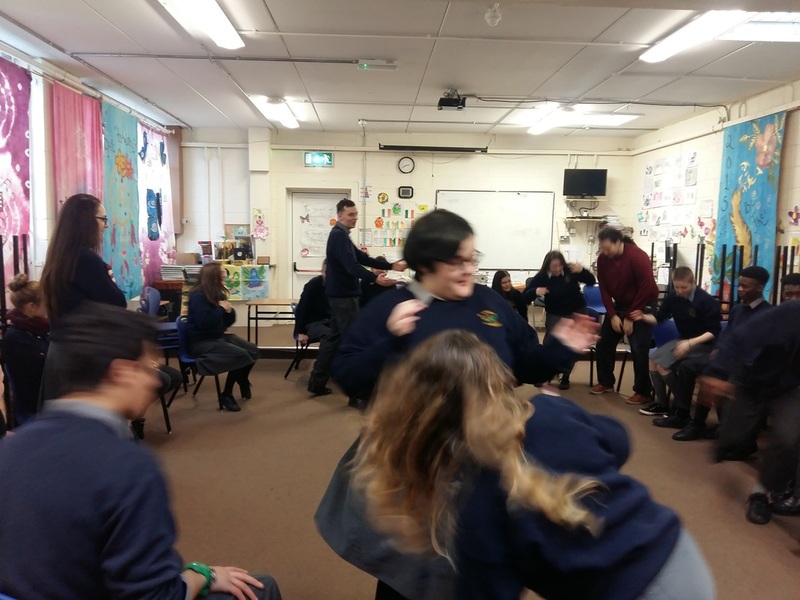 They have explored mindfulness and meditation and to mark the end of their second year term with Miss Kelly, today they learned some traditional Indian dances with help from fellow student Anjali Singh. I think it’s safe to say that these students have enjoyed RE classes immensely and Miss Kelly is very proud of their work to date. Wider Options is a one year mature adult education programme (mornings classes, Monday to Friday). An information meeting will be held on Tuesday 22nd May 2018 at 10am in the school. ​This programme is ideally suited to people who have been in the home for a number of years or have retired, those working in minimum wage jobs who wish to progress their career, people who left school early without a formal qualification or people with school going children who wish to upskill. run Alert Class Helping students​ "JUST Right"
ALERT is an American programme, which was adapted by the NCSE’s Occupational Therapists to help students who have difficulty monitoring, maintaining or changing their levels of alertness, as appropriate for different situations/tasks. For example, your level of Alertness at home on the couch watching TV, should be different than your level of alertness playing a football game or at a music concert. The same way your level of Alertness for a double PE practical lesson should be different than your level of Alertness for a meditation lesson. In the programme alertness is likened to a car engine and the students learn: “How their engines run”. The same way that an engine needs fuel to run smoothly, so does our body, and how the wrong fuels can change our engines eg: high sugar drinks and high salt/processed food. Students also learn how various engines run differently and how not every engine is the same eg: Fiat Punto ('running low') vs Audi R8 ('running high'). The programme identifies students’ sensory needs and preferences and encourages student use of sensory motor strategies to support self-regulation so that their engines are running ‘just right’ for example: chair stretches, movement breaks and discrete fidgets. The strategies and activities taught can be incorporated into home and school routines eg: having a bottle of water with them at all times or checking their pulse. 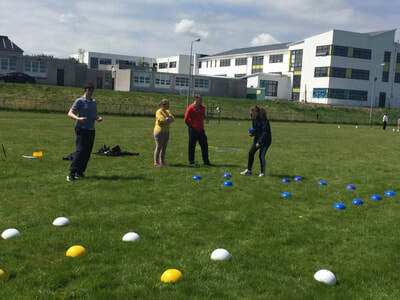 The 2C class have been doing excellent work in this programme and had a special visit from Shona O'Donnell NCSE Occupational therapist who did a movement session with them this week and was very impressed with the student's progressed. The Intercultural Music & fashion Show will not take place on May 10th, 2018. The show is being rearranged to take place during the first term of the 2018/2019 academic year at a date to be decided. Drop Everything and read @ St. Conleth's C.c. Drop Everything And Read is an initiative from the JCSP. The idea of the initiative is that at a set time every day for a week everyone stops what he or she is doing and reads for fifteen minutes. It is a shared experience and gets people talking about books and reading while conveying a strong message that the school believes in reading. Students read, principals read, teachers in the staffroom read, phones are taken off the hook and secretaries read, the caretaker reads and visitors to the school are offered books or magazines to look through. In preparation for this, Ms. Talt and the English teachers ran a Book Fair. At this Book Fair all students were given the opportunity to choose a free book. This book will be given to them during our DEAR week which starts on Monday the 23 rd of April. Today, Thursday the 12th of April, marks our very first Jobs Fair for the Social Care and Nursing Studies groups. This is a unique opportunity for employers to meet with our students who will receive their QQI awards level 5 &6 in the near future. Thanks to everyone involved, in particular the agencies for coming on board for this Jobs Fair. The YSI Speak Out Tour brought together all the young social innovators in Ireland in any one year. Those who are actively engaged in changing the world for good and participating in the YSI Action Programme (senior level) come to our regional events to Speak Out. St. Conleth's Community College had 2 Transition Year groups attend the local Speak Out in The Royal Marine Hotel in Dun Laoghaire. 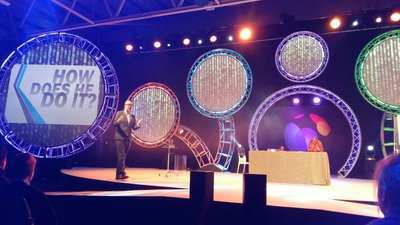 To see the excellent ideas from the day, watch the videos below. The LCA 1 class had a very busy week last week. First they attended a talk by Adam Harris from ASIAM on Autism. 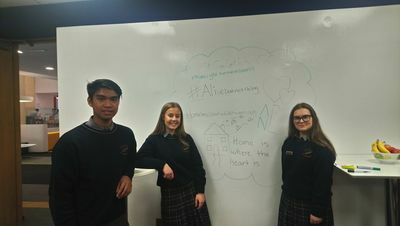 ASIAM was also the charity that the students decided to donate the money from their enterprise task to. 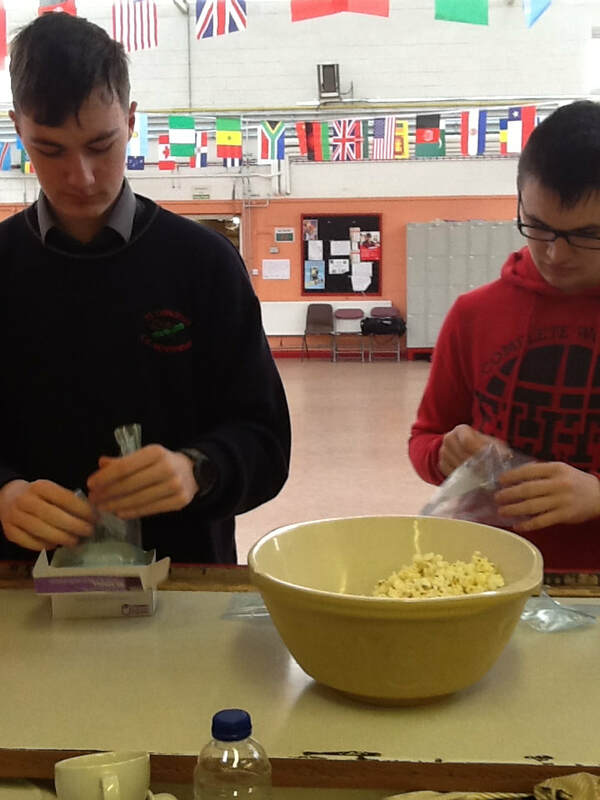 They baked and sold delicious brownies and mouth-watering popcorn in the school shop on Friday 16th March. In total, they raised €217 for the charity. Well done to all involved. Congratulations to the 5 LCA1 and 7 LCA2 students that received full credits in session 1 and session 3 respectively. LCA1: Sian Mullins, Dylan Farrell, Jack Heavey, Kyle Flynn and Cole Winders. Our very successful Pop-up Concert is on the go once more. The previous concert was well received by both students and teachers and passers by. When: Wednesday 21st March, Period 6. REMINDER: 6th years who have applied to HEAR or DARE, the deadline for submission of supporting documentation is April 1st, 2018. Congratulations to Transition Year students from “Magic Spray” (Roisin Cullen, Maeve Garner, Jena Hughes O Neill, Niamh Pender and Caoimhe Gately) who won a trophy and bursary for the “Best Business Report” at Killashee House Hotel on March the 9th. The award was presented by the Mayor of Kildare, Martin Mikey and CE of Kildare County Council, Peter Carey. 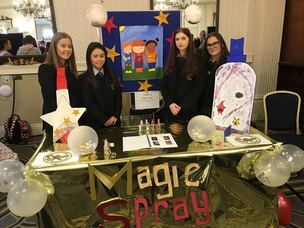 For their TY mini-company, the students produced and marketed their product magic spray, which helps young children overcome their fears. 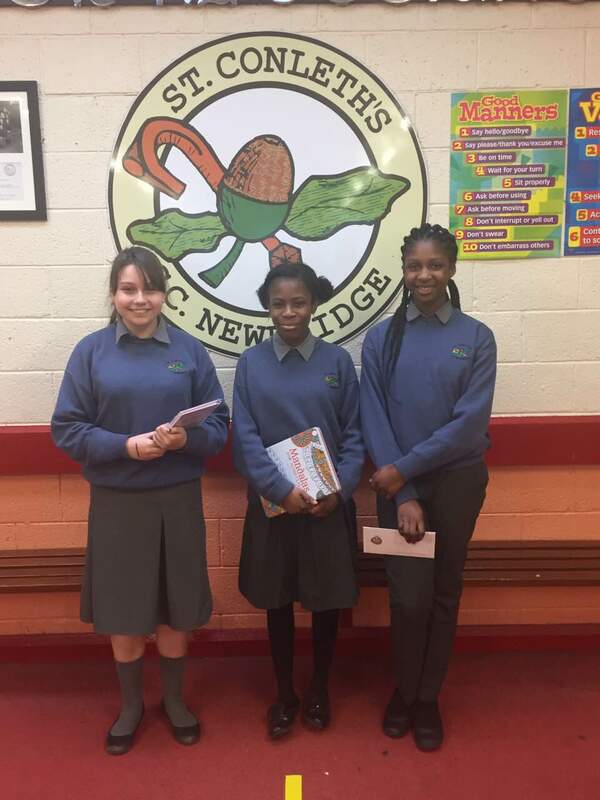 Another TY group who were nominated for the Kildare Regional Finals were “Catch that Dodie” (Niamh Walker Browning, Victoria Kanu, Damsi Odunuga, Lydiah Wambui Kagwi and Aisling Cousins). They were interviewed by some top business people and learnt a lot from their experience. 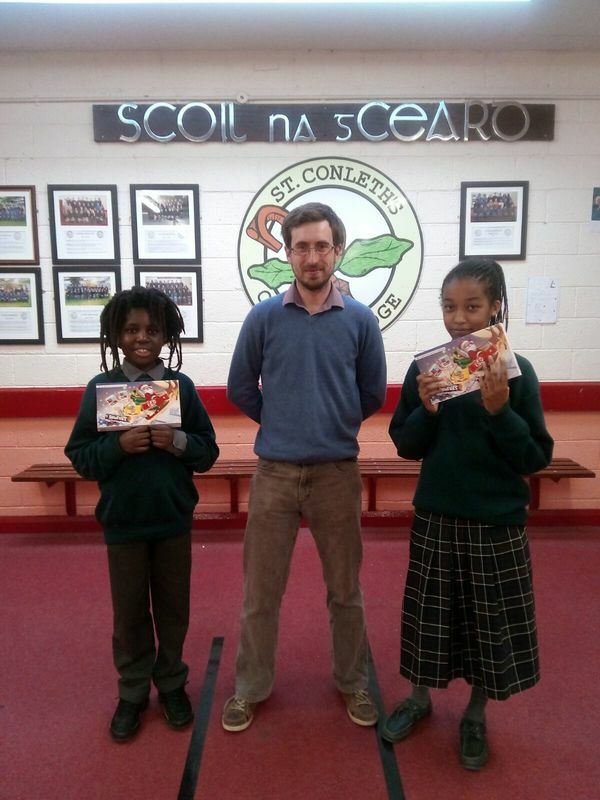 Due to the successful publication of our International Cookery Book in May last, It is the aim of St Conleth’s Parent’s Association, in conjunction with the Home School Community Liaison person (Ms Maxwell),to run an Intercultural Fashion and Music extravaganza.This will extend what was started with with the book by representing both Ethnic and Irish communities. This show will be held in our Gym on Thursday May 10th at 8:00pm.and will act as a fundraiser for our new school. In order to run this show successfully, we would hope that as many parents and students as possible from our ethnic community(30 nationalities in all) and from our Irish community ,would represent his/her country on the night. Since October last, we have a group of dedicated parents doing some excellent sewing work.They have designed a backdrop , representing all relevant nationalities in our school. 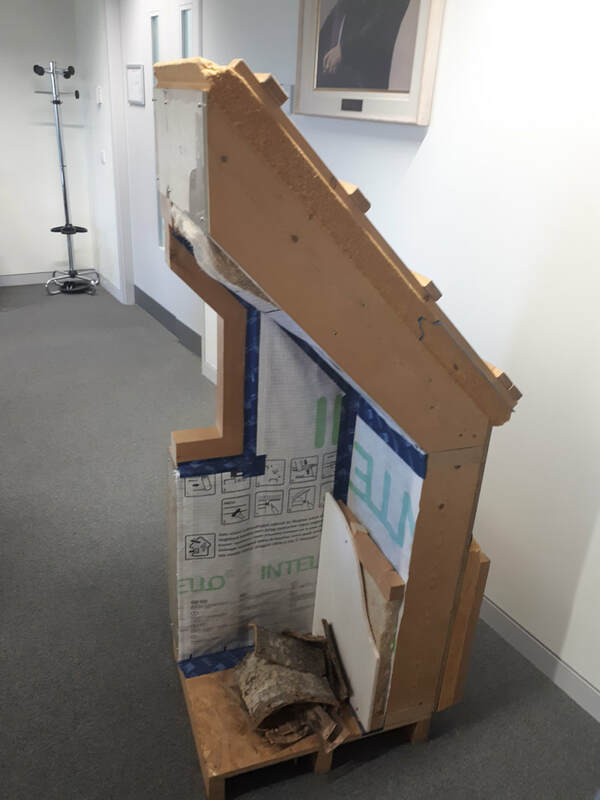 This will be unveiled on the night of the show. 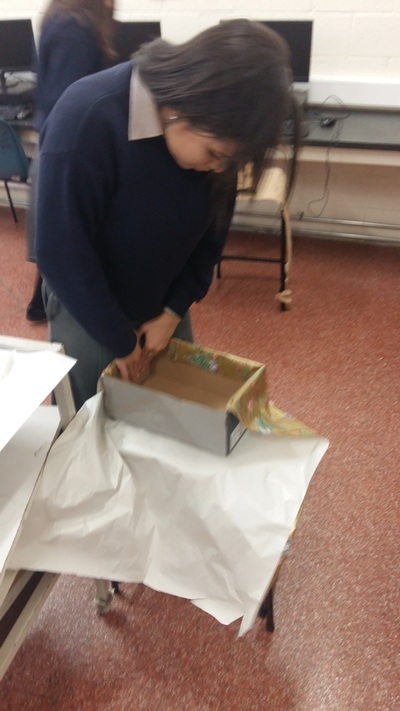 This group are now designing their own traditional costumes, which they will model on May 10th. We are sure that there must be many other parents out there who have their own traditional costumes or clothing that would be typical of their country, and who would be willing to represent their country on the night of the show. Please contact HSCL (MS Maxwell) ASAP if you are interested. A letter and flier will go out to each family in the school. There will now be a suggestion box in the front office for student council information. 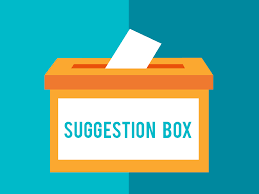 Students are encouraged to put any suggestions for the school or the student council in the box anonymously . 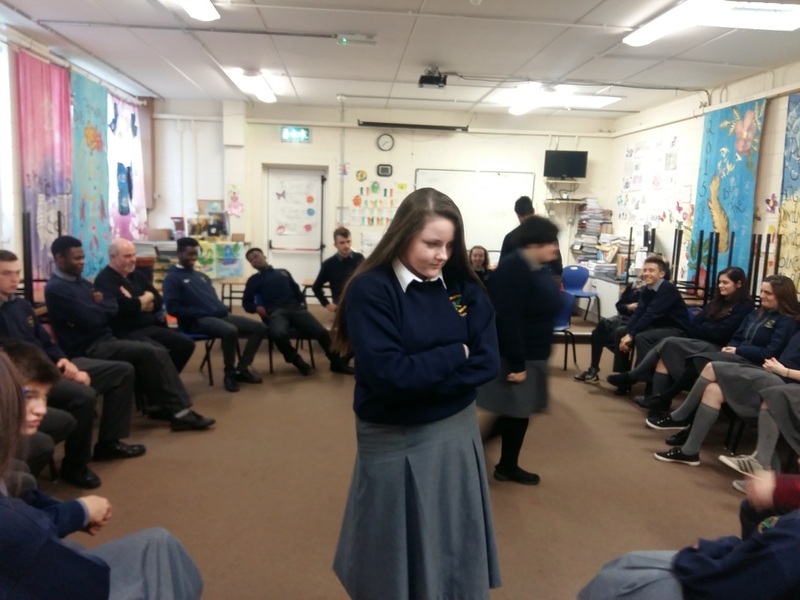 ​To commemorate the 20th anniversary of The Good Friday Agreement 1998, Miss Kelly and a small group of students from first and second year have put together a drama reflecting on the peace process. The drama will be recorded and entered into the Department of Education and skills history competition, which commemorates this significant moment in Irish history. The play incorporates aspects of reflection, beautiful traditional Irish music and tells the story of the Good Friday Agreement from the viewpoints of key personalities involved in the process. ​The play will be staged during our local June fest celebrations. 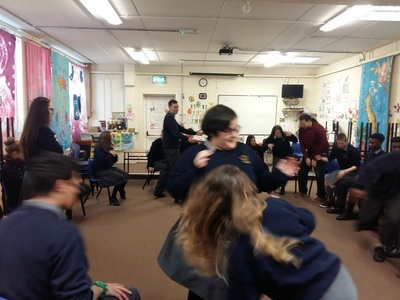 Drama is held each Friday in room 11 with Miss Kelly for the students involved. We wish them well with their competition entry. ​Watch this space for further snippets of the play! As we return to school after our break, students are encouraged to become involved in any extra curricular activities open to them at lunchtimes or after school. and many more. Look on the school notice boards for more information. 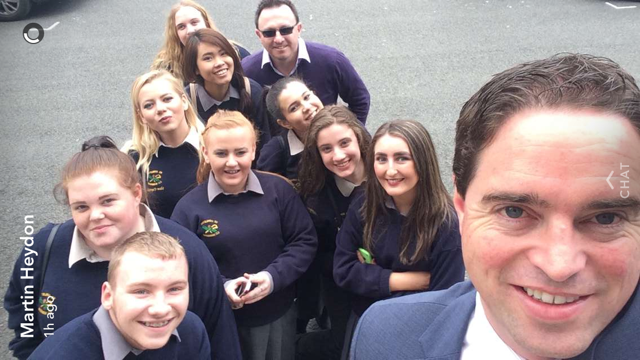 A number of 6th Year students travelled to I.T. Carlow on January 18th for a Construction Studies Revision workshop. During the Workshop we experienced demonstrations, working labs and Lectures relating to the Construction Industry. 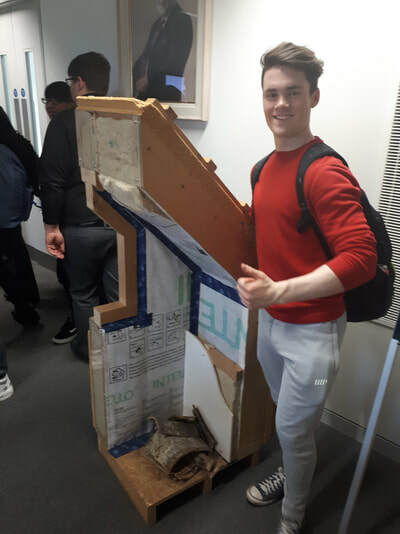 Our students learned about sustainable building techniques and about the principles surrounding passive house concepts, all of which are part of the Leaving Cert curriculum. The students gained a valuable insight also into the career choices relating to Construction Studies and the built environment. Lecturers gave the students an insight into the daily lives & career progression of a Quantity surveyor, Civil and Structural Engineer, Architect, BER assessor, Health and safety officer and facilities and energy manager. 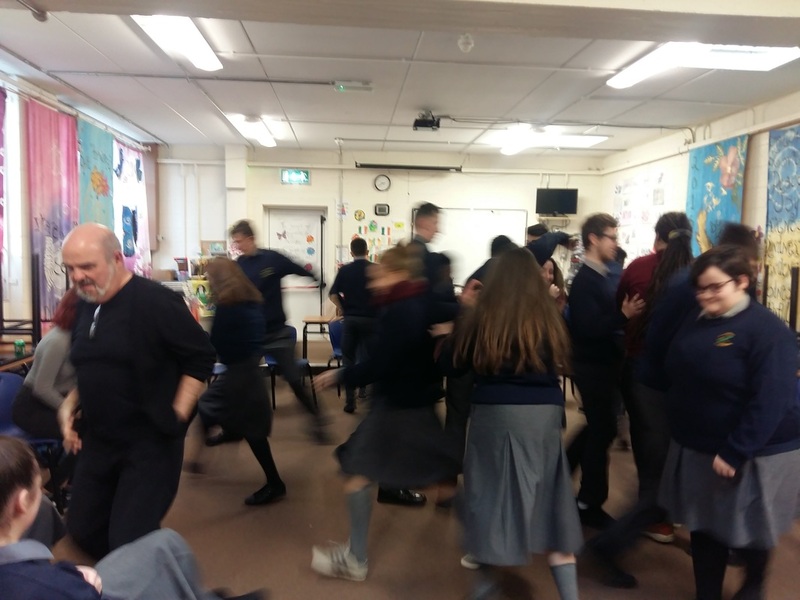 We found the workshop to be very interesting, informative and especially effective as a means of revision as we progress towards the Leaving Cert examinations. Many thanks to I.T. 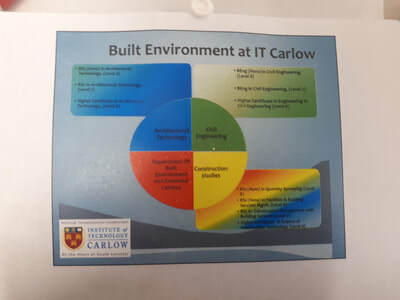 Carlow for inviting us to attend and to the Students of St. Conleths who, as always, aquitted themselves very well on the day. 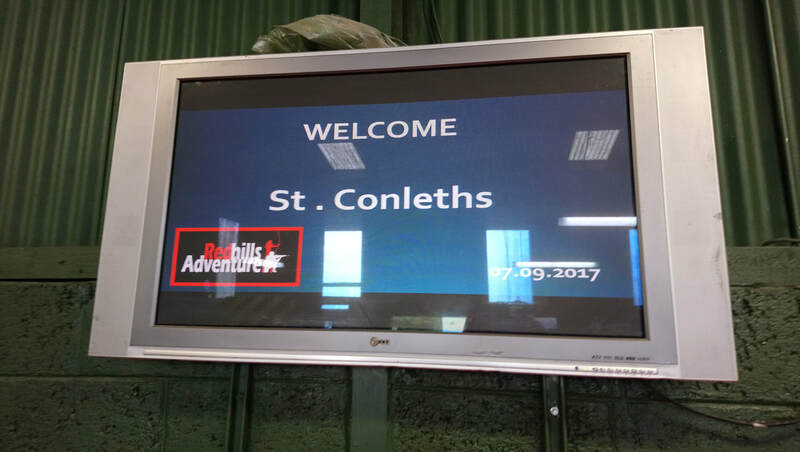 Follow St Conleths Technology Department @stconlethscc on twitter for further updates, informative links and examples of students work. 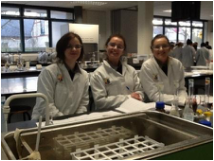 6th year students at St.Conleths took part recently in a series of science practicals held on campus in Maynooth University. 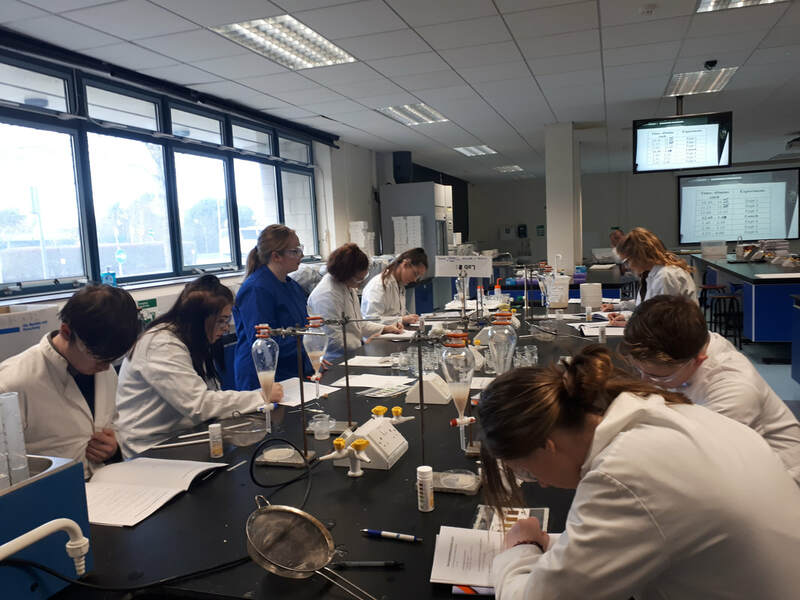 The event helps prepare students for their leaving certificate biology practicals by giving them access to laboratories and equipment in order to conduct biology experiments under the supervision of lectures at Maynooth University. Reminder to all 6th years! The deadline for the discounted application fee of €30 for C.A.O. application fee is January the 30th at 17:15. St. Conleth's Community College has just taken part in one of the oldest school competitions in Ireland. The competition has been run for 54 years with BT being the current competition sponsors. 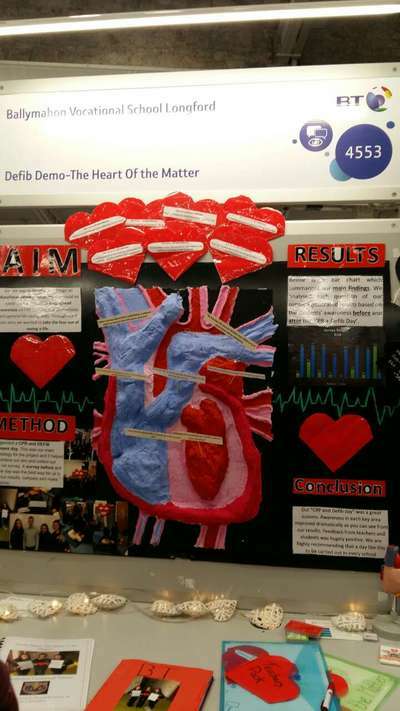 A project by students from St. Conleth's was picked from 2031 projects to be presented in the RDS. ​The project was entered in the Technology Section and was called "Reducing Anxiety in First Year Orientation, using a 3D Game". The project was monitored by Mr. Quille and Ms. McMahon in St. Conleth's. Students involved produced an interactive game that was based on the map of our school. ​Here are a few photos from the exhibition. On Friday the 1st of December, members of the JCSP classes of first, second and third year went bowling to K Bowl. These are a few pictures from the day out. The 5th Year French class attended a viewing of the Oscar nominated animated film Ma Vie de Courgette in the Riverbank, Tuesday 14th November. It was so convenient for the students to be able to walk to the Riverbank! 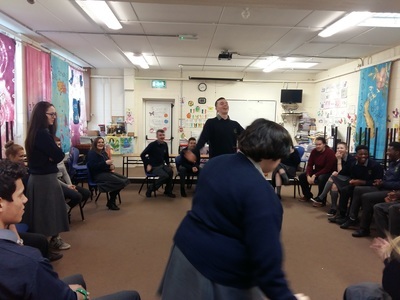 ​Comedian Ger Carey performed a comedy show for transition year students recently in the Riverbank. Ger has uncovered the weird and frightening world of the teenager! The aim of the show is to get teenagers to laugh at themselves and appreciate the differences of others. A C.A.O. information night for 6th year students and their parents & guardians will be held here in our school on November 16th, 2017 at 7:30pm. Guidance will be given to those in attendance on what the C.A.O. offers and how to apply and make the most of your choices. A number of activities are taking place in our school to mark Science Week. A daily puzzle on the science noticeboard. All correct answers will go into a draw. 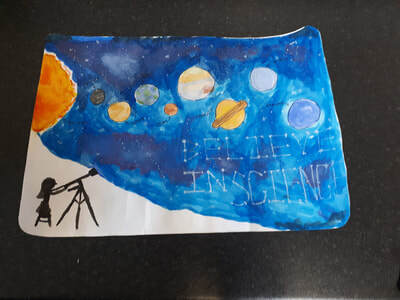 An Earth & Science workshop will be arranged for students to make their own 3-D model of our solar system. 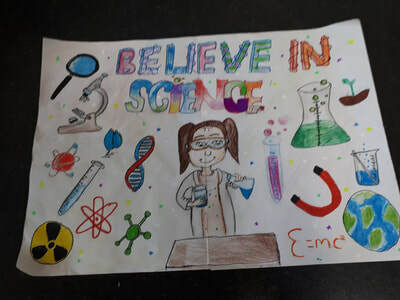 Science Club to run every lunchtime for science week. A science trail of puns and fun facts are placed around the school. The first 15 people to complete the trail win a prize. 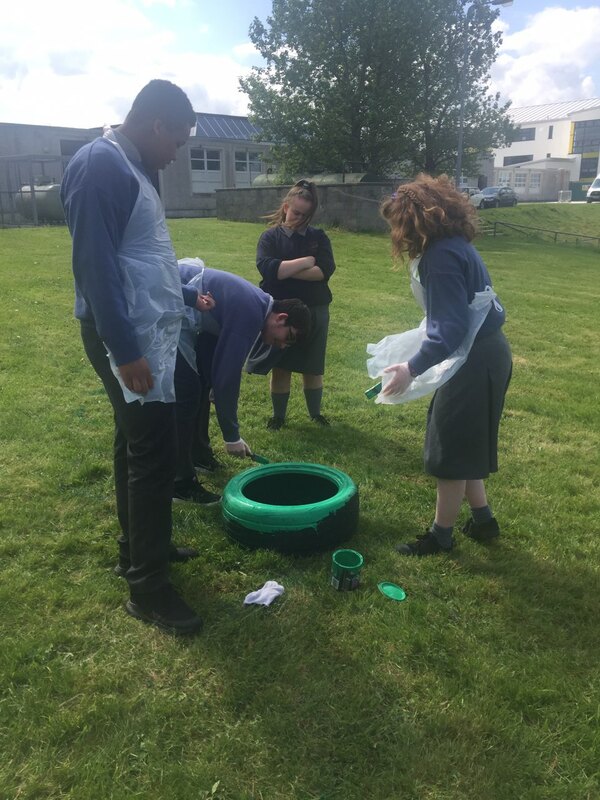 This years TY class are in the process of completing the Mini Company task. For this they have to get creative. They have to choose an idea that will produce a finished product that they can sell, once production is complete. They will be involved in every area from research to creating,from material buying to production and from selling to doing accounts. Here follows some of the very creative ideas from this year's TY group. Maeve, Roisin, Jena and Niamh are selling a monster repellent spray to protect children from their fears. This is a comforting spray to provide a feeling of security before they go to sleep. The next mini-company are producing handmade birthstone keyrings. These unique keyrings can be customised with the design of your choice. 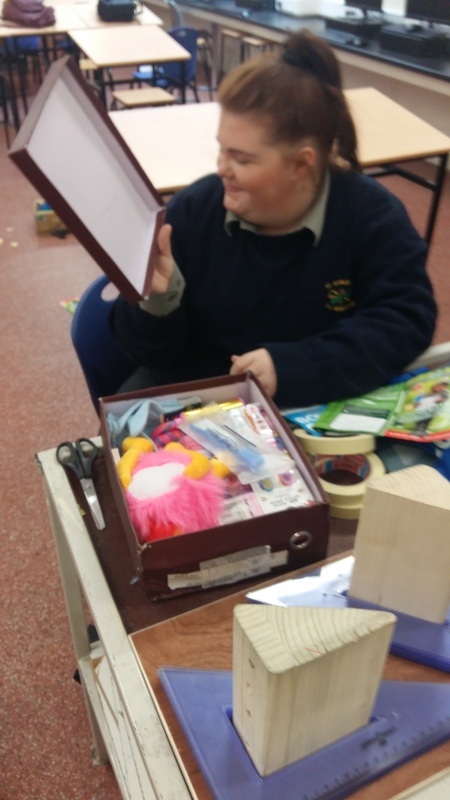 Naoise, Vanessa and Caoimhe are making a girls survival kit to assist you in any situation. the survival kit will be made from recycled clothes to show that recycling is important. Follow the girls on instagram on the following link. A popup Concert took place in the School's Assembly Area on Friday the 27th of October. Ms. Gilmartin's First Year music class along with participants from other years took part in the very special event. Students and Staff were entertained by the music and singing as they went between their classes. On Thursday the 26th of October 53 second years together with teachers and SNA's visited Castlecomer Discovery Park in Kilkenny. This was in celebration of Maths Week Ireland. 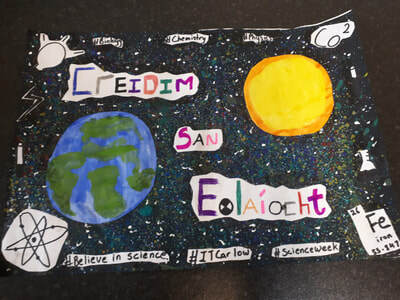 Students at St. Conleth's Community College have developed their creative side by designing a poster for Carlow Institute Of Technology. the idea behind the poster is to promote stem subjects within our classrooms. We wish all our students well and thank you for taking part. Former Kildare captain Johnny Doyle visited St Conleth's Community College on Friday, 20 October to present the school with a bag of sponsored GAA equipment from TOP Oil and Leinster GAA. 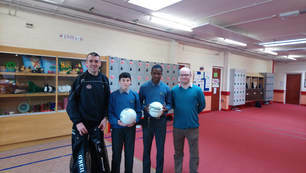 Brendan Booth and Ian Igberaese accepted the gear on behalf of the school football team. First Year students were introduced to their Transition Year mentors for the first time last Thursday afternoon, 19 October. Each mentor will liaise with the First Years over the next few months and help ease their transition from primary to secondary school. 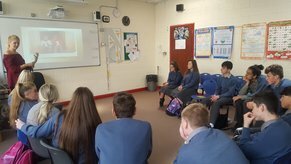 TY students along with their teachers Mr. Cowley and Ms. O'Crowley attended the Offline film festival in Birr, County Offaly. They attended an event called the "Mini Movies Project". On Thursday, September 28th, St. Conleth’s Community College warmly welcomed 5th and 6th class students from local feeder schools. These schools included Scoil Mhuire senior school, St. Patricks NS, Patrician Primary school, Educate Together NS, Scoil Naomh Uilig, Scoil Bhride Miltown and St. Conleth’s and Mary’s primary school. 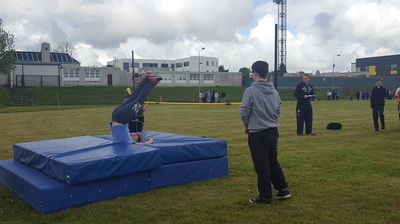 The student groups were treated to a tour of the school’s facilities by senior students and staff, interactive practical subject demonstrations as well as the opportunity to view displays of current and past student work from accross the school curriculum. St. Conleth’s CC open evening will take place in the new year in the brand new school building which is currently under construction between the existing school and the schools sport’s complex. Our new school uniform for First and Fifth years is available through an online Company. The new school uniform is being modeled below in the article about our junior cert results. ​Transition Year and Leaving Cert Applied students travelled to Tullamore on Thursday to visit the National Ploughing Championships. The students were among a crowd of 92,000 attending the final day of one of the largest agricultural events in the world. 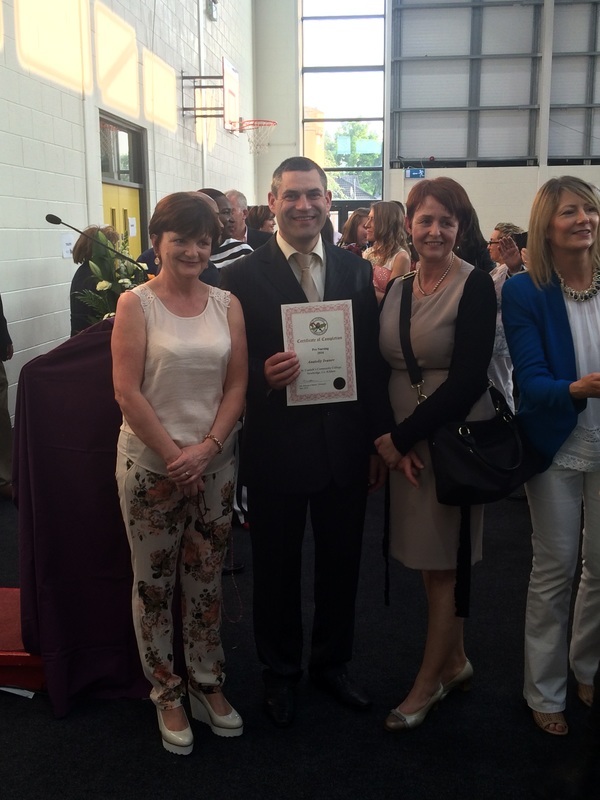 The teachers and parents of Junior Cycle students at St. Conleth’s Community College are especially proud this year. 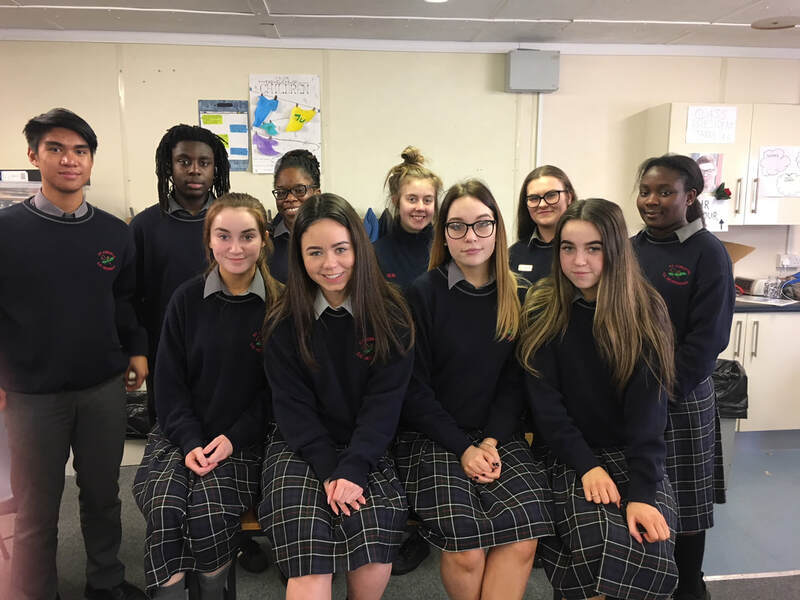 The group, who received their results last week, were the first year to sit the new Junior Cycle English exam combined with their other subjects. The students have now moved into one of three senior programes offered at St. Conleth’s CC, which include Transition Year, Leaving Certificate Vocational Programme and Leaving Certificate Applied. Some high achievers from this year’s group are: Niamh, Uchechi,Ben ,Jahnavi ,Damisi, Lydiah and Ernesto. Two of these students will be presented with special awards from the school to recognise their achievements at the next school award ceremony. 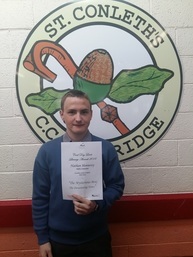 We want to congratulate every student who completed their Junior Cycle at St. Conleth’s CC and wish them all the best in their senior cycle studies. Transition years from St.Conleth's went to TY EXPO 2017 at Punchestown Racecourse Event Centre on Tuesday the 12th of September 2017. There both students and teachers were able to discover everything that's on offer to them, connect with the right people and be inspired for the year ahead. Junior Cert results were given out to 5th years,LCA 1 students and TY's Wednesday 13/09. St. Conleth's C.C.would like to congratulate all on students on their results. 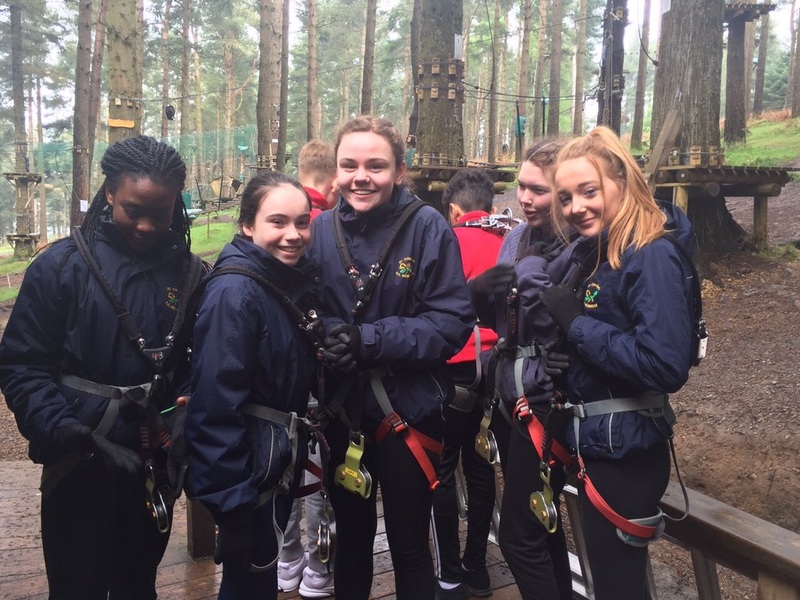 Higher Options: PLC students and 6th year students travelled to Higher Options 2017 in the RDS. There they got a chance to visit and talk to colleges and universities and get information on courses. Students from 2nd years through to Leaving certs along with teachers Ms. McGovern, Ms. Doyle, Ms Hipwell and Mr. Whyte are on tour in Paris. More to follow. Childline will visit the school in the coming week to speak with the first years students. 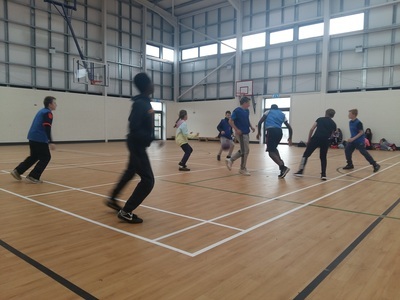 Students have the opportunity to get active and to become involved in clubs at lunchtime. The following is a list of clubs and training that are in place this September. Monday: Music in Rm 17, Girls Football/Soccer in the Sports-hall. Thursday: Reading/Book Room in RM 9, Futsal/Soccer in the Sportshall. The students of The Cherry room, their teachers and SNA's ran a very successful coffee morning this morning,14/09. The coffee morning raised funds for Our Lady's Hospice & Care Services, Harold's Cross and Blackrock. With plenty to eat and an endless supply of tea or coffee, everyone involved had a very good morning. ​Here are a few snaps from the morning. 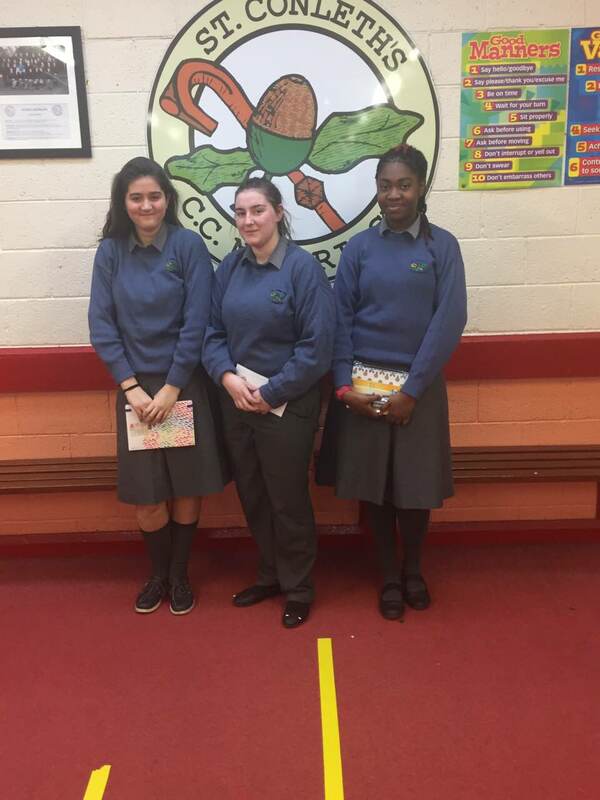 Transition Year @ St. Conleths C.C. 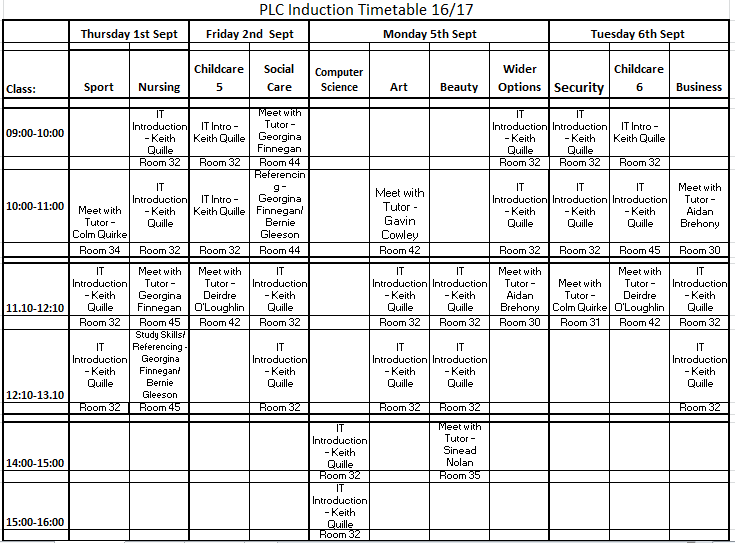 The above dates are for the induction of the PlC classes in St. Conleth's Community College for the academic year 2018/2019. Please attend the classes on time on the day specified. See PLC web pages for more details. The following is the return to school schedule for second level August/September 2017. The following is a poem composed by the 1 Y tutor group to mark the end of their great year at St. Conleth's. we were all in exhaust. we finally began to commit. And Rayanna wrote a poem about December. I'd say it was nice. When we came back we wouldn't even remember everyone's names. In no time we were back to the books. 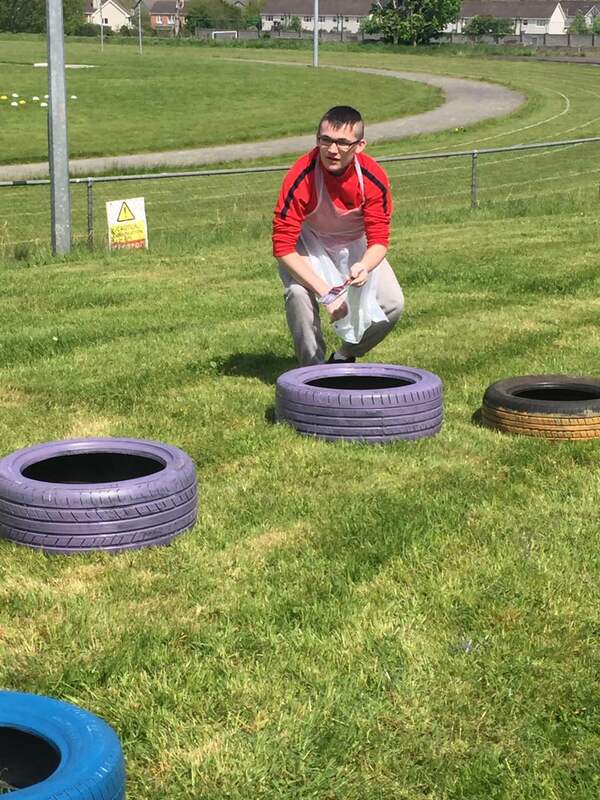 The beginning of the operation transformation race. And we ran it with grace. Soon it was Rayanna's b-day. The school shop soon was in rags. Everywhere on the the way. they visited the arena to play. the exams came into play. this was our final round. ​2nd year is around the bend. 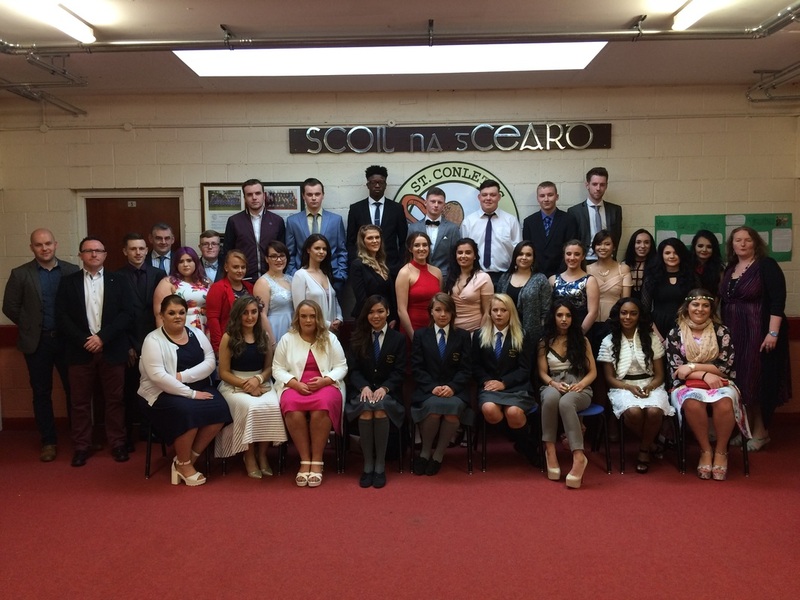 Last Thursday May 25, the Leaving Cert class of 2017 graduated. The graduates and their families along with teachers from St. Conleth's celebrated the 5 years that the students spent in secondary school. 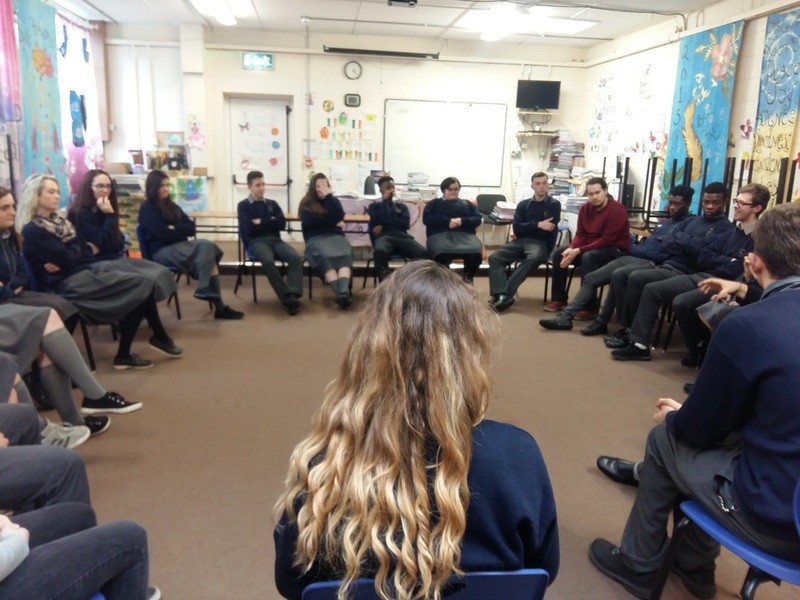 Below are photos of the last day of classes for the 6th years.There was a chat and chew session, where students got to reflect and say some goodbyes. Below are the student award winners on the evening. Congratulations to all. Pictured below are also of the presentations made by the leaving certs to teachers at St. Conleth's. Graduation night also involved the unveiling of our new student captain and vice Captains. We wish Cornel, Joseph and Chloe all the best in their new role in the 2017/2018 school year. 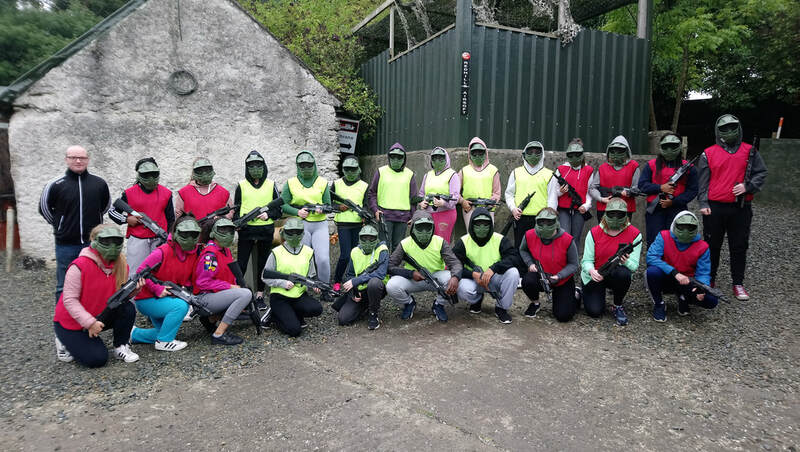 On Thursday May 25th, four 5th year students from St. Conleth’s Positive Mental Health team, accompanied by their teacher Ms. Kingston, made their way to Cork for a very special event. 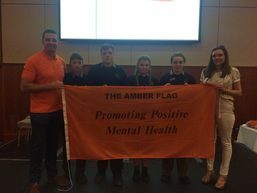 The group were presented with an Amber Flag to commemorate the work that they have been doing all year to promote positive mental health in the school, including a Positive Mental Health Week, PMH notice board and a PMH section on the school website. The awards which included speakers from Pieta House as well as rugby star Alan Quinlan, included students from all over Ireland who have been working hard to promote positive mental health in their own school communities. 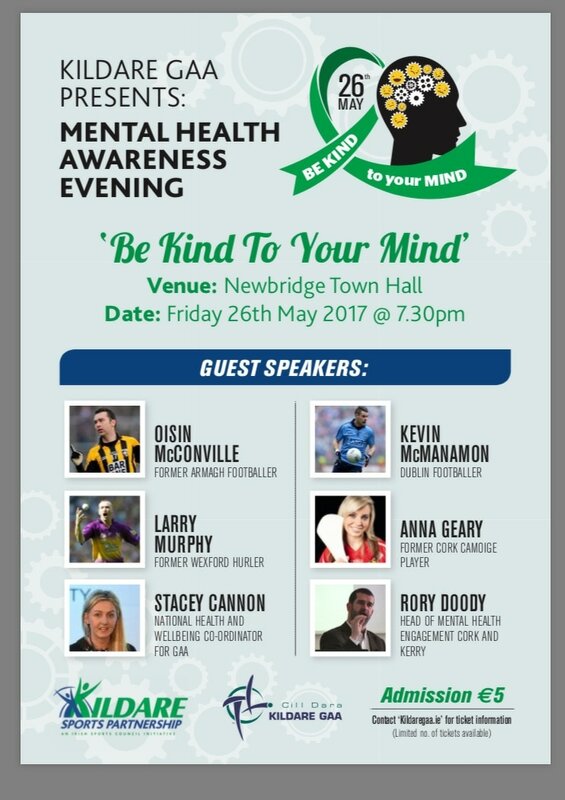 St. Connleth's Community College would like to help promote and support Kildare GAA in their mental health awareness event due to take place on Friday the 26th May in Newbridge Town Hall. Guest speakers on the night include former Footballers and camogie players from Armagh,Dublin and Cork, among other. The speakers will give their insight and experiences dealing with metal health issues. The launch of our new Cookery Book,"Recipes from around the World" took place in the Assembly Hall on Friday afternoon May 19th @ 3pm. It was a wonderful afternoon. In attendance , were Mr. Sean Ashe CEO, politicians, sponsors, members of the community, teachers, parents, students and visiting chefs.Entertainment was provided by our very own Singing Chef's and our DJ in residence Mr. Gavin Cowley. The book was launched by Niamh Swail, The Ivy Cookery School, Feighcullen, Rathangan, Co. Kildare. Parents, whose recipes featured in the book, brought along samples of their signature dishes which went down a treat on the day. A great day was had by all. Mr Quille and students from St. Conleth's enjoyed launching a rocket that they made in Science. 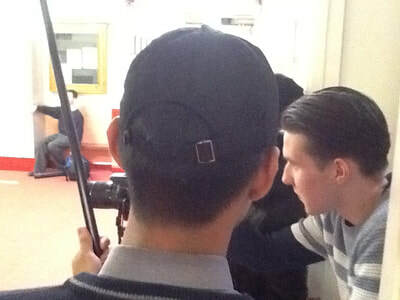 ​Students from all years attended and we hope you enjoy the pictures and videos taken at the event. We were delighted today, Wednesday 24th May, to have a visit from Niamh Mulqueen from the charity Bothar. 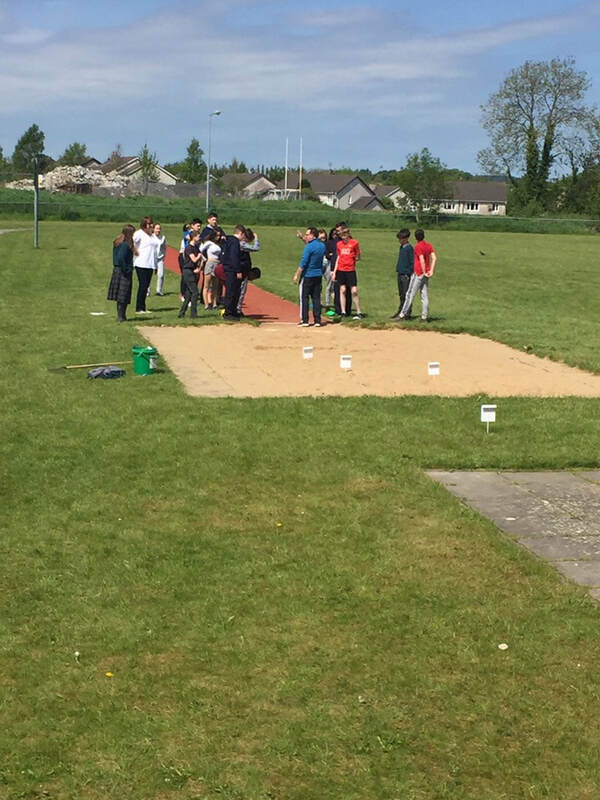 2R CSPE class organised a fundraiser to raise money for the charity. The charity sends various types of animals to people in poorer countries. The families then use them for sustaining themselves and as a source of income. The responsibility is then that the first born of the animal received get sent on to other needy families. For more information on Bothar, click on the following link. Thursday the 18th of May saw first year students travel to Waterford. The trip brought them to Freedom Surf School in Tramore. The day was filled with new experiences and lots of new skills learned.Students were given land based instruction at the surf school base, covering surfing technique, equipment, water safety and ocean awareness, before heading into the water to put what they had learned into practice. All arrived back safe and happy but tired after a long day. 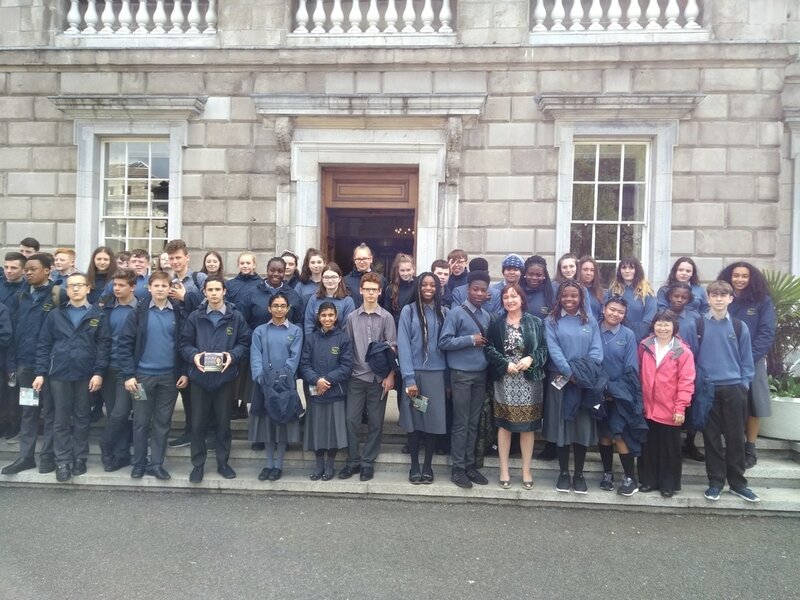 On Tuesday the 16th of May the students of second year paid a visit to Dail Eireann. They had been invited to visit by Fiona O'Loughlin TD. Fiona had visited the 2B CSPE class of St. Conleth's Community College. ​A great day was had by all. 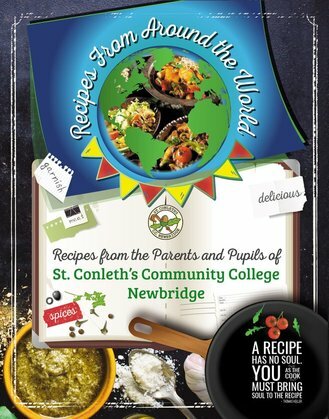 The cookery Book Launch of "Recipes from around the World",which features recipes from parents and students of St. Conleths Commuity College and some guest recipes, will take place in the Assembly Hall on Friday May19th @3pm. Niamh Swail, from Ivy House Cookery School will launch the book. A selection of signature dishes from the book will be available to sample on the day along with some finger food. Students of St.Conleth's Community College were excited to visit Baroda Stud located in Great Connell. The visit links with topics of horticulture, veterinary, horse farriering, animal care and exercise. Interested students were encouraged to apply for a weeks work placement this summer to gain a greater insight into the working of the stud farm. This is our 6th year of our partnership with P & G Newbridge under the Business in the Community Initiative. This programme is offered to our Fifth year group each year. As part of programme the students get the chance to partake in a manufacturing facility visit, job application seminars and professional mock interviews. This is of huge help to our students in their personal development and as part of their school work in subjects such as LCV and Business Studies. We are extremely grateful for the time and effort Kieran Conway and his team in P & G give our school. We hope it continues for a long time. 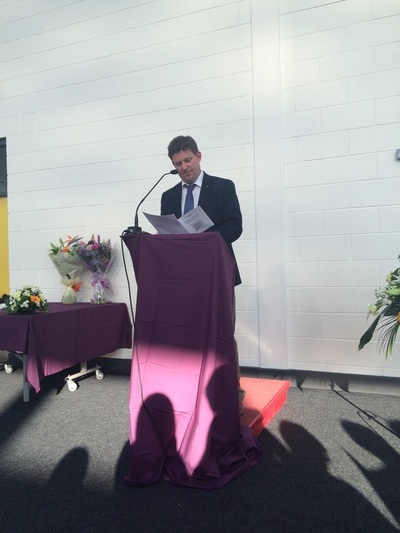 Congratulations to all the award winners at St. Conleth's Community College. Maynooth Access Programme(MAP) awards recognise the outstanding contribution that young people, teachers, students and alumni make to the University, to current students and to our wider community. 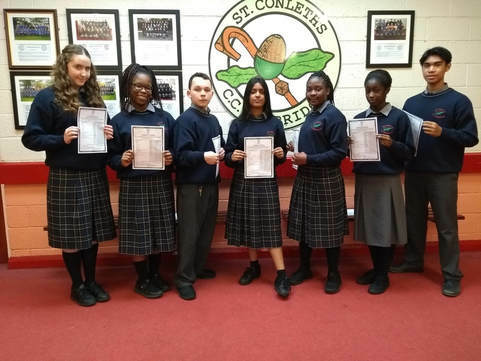 Uchechi Ugwuegbulem, Roisin Cullen, Ben O'Connor Chloe Geoghegan, Ernesto Gayahan and Jamie Dee won MAP awards for English, Irish, Maths, Science, French and German respectfully. 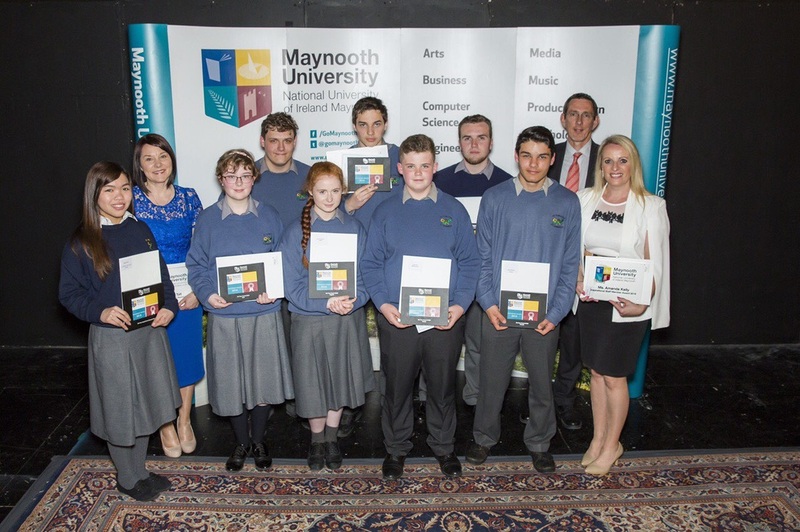 Kingsford Mensah and Melissa O'Reilly were award 6th year Inspirational Student MAP Awards. they in turn nominated Mr. Coleman and Ms. McGovern as their inspirational teachers. 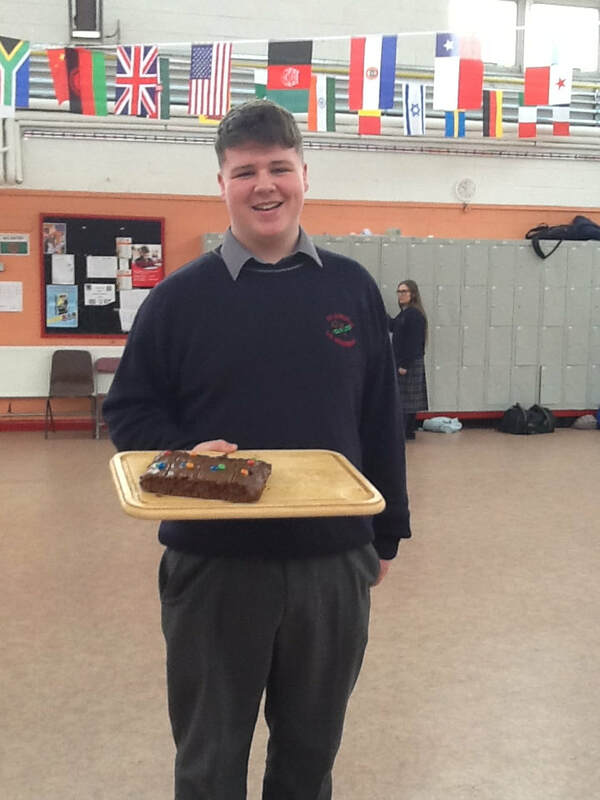 2nd Year St. Conleth’s Student Qualifies for Bebras Challenge Finals! 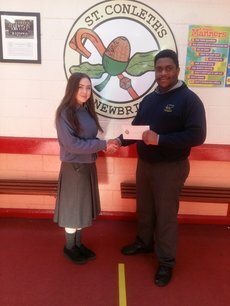 Israel Abgetuyi competed against thousands of students all over Ireland and was chosen as a finalist in the national Bebras Challenge. 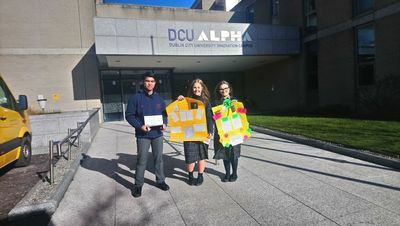 Israel attended the finals which took place in Maynooth University, where he was presented with his certificate. The competition was run in the school by Mr. Quille with the help of other teachers, where the students had to solve a number of interactive tasks online. The Bebras® Computing Challenge introduces computational thinking to students. It is run in over 30 countries and takes place every November, with the final taking place in April as a part of Tech Week. The tasks can be answered without prior knowledge about computational thinking or information and communication technology. The aim of Bebras is to get students all over the world excited about computing. The ICS Foundation who organise the competition are a registered charity charged with advocating for digital literacy and the use of technology in education, research and developing policy on all aspects of ICT and supporting the ICT profession in Ireland. From September St.Conleths Community College will be introducing a new school uniform for 1st and 5th years. 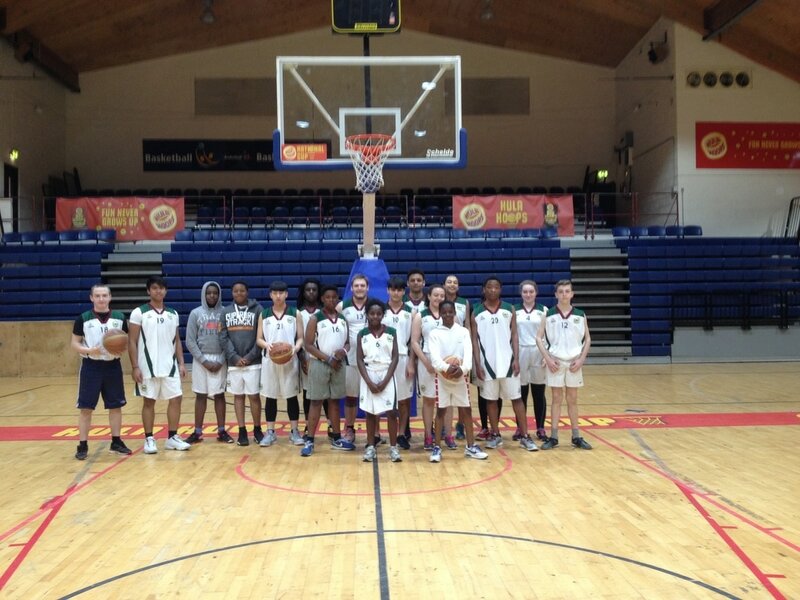 Members of the boys and girls basketball team made the trip to the National Basketball Arena in Tallaght last Thursday, 13th April. 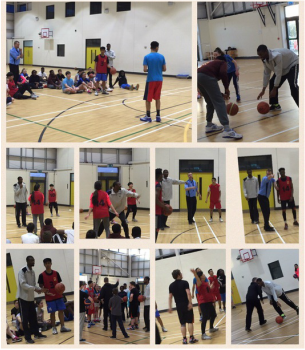 Students had the opportunity to train and play games on the court. A great day was had by all. The 2nd year history students had an interesting and informative trip to Croke Park on Tuesday 23rd March. The students were treated to the Bloody Sunday tour of the stadium which included the skyline tour as well as a full run down of the events that took part in Croke Park on that fateful day. A great day was had by all! A soccer tournament is running every Tuesday at lunchtime. Teams and Fixtures updates on the notice board in the Assembly Area. The School Bank opens every Thursday at lunchtime in Room 10. Volleyball runs lunchtimes on Thursdays in the School gym. Tickets were on sale in the school for the LilyO'Brien Hamper and other wonderful prizes. Well done to all the winners! Table Tennis is ongoing in the gym at lunchtimes on Fridays. A meeting will take place for 3rd year students and their parents/ guardians on Thursday march the 23rd at 7:30 pm. The purpose of this meeting is to provide information on the various options for 3rd year pupils who are progressing to Senior Cycle in September 2017. It is very important for all parents(s)/ guardian(s) to attend this meeting. Reassurance for you that there is support available. Information on the grieving process. Knowledge on how to respond and support children and young adults. Information regarding things to be aware of and what to do if you are concerned. A workshop for Parents/Guardians on "Ways to Well-Being for Students" will take place in Kildare Education Centre on Wednesday the 29th of March from 7:00pm to 9:00pm. John Doran, a secondary school teacher from the Patrician Secondary School who is a guidance counsellor will deliver this workshop. 2 Orange have been running a 'Lets Delete Cyberbullying' campaign for their CSPE Action Project. Students have created posters that are now on display in the two computer rooms. They have also designed a website which contains information about the issue and the results of a survey of second years about their experiences of cyberbullying. St. Conleths C.C. are now accepting PLC applications for the academic year 2017/2018. For a chance to view the courses that will be available visit us on our Open Day here in St. Conleths on Station Road on Wednesday the 8th of March between 11a.m. and 6p.m. On that day you will be able to meet with class tutors and current students to discuss your course of interest. For more information on the following courses click on the following link. 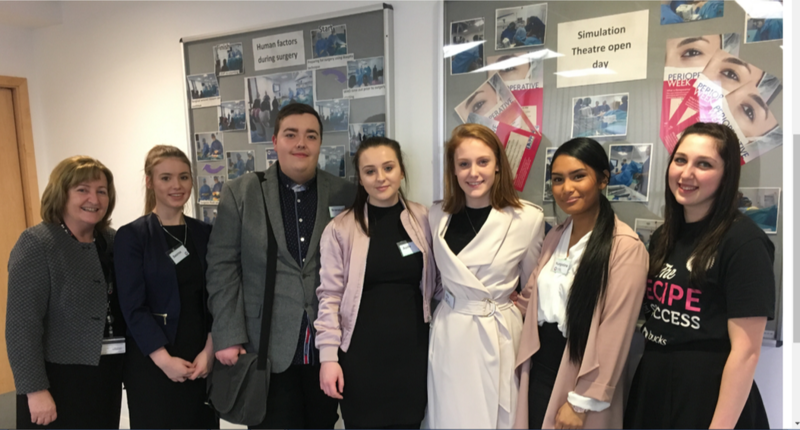 PLC students from the Pre-Nursing group headed over to interview at Bucks New University in Uxbridge for interviews with the hope of enrolling for Nursing courses for the academic year 2017/2018. 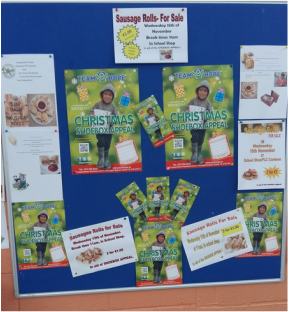 A sale of work was held in the school on Tuesday the 17th of February in order to raise funds for the publication of our new Cookery Book. The book will be available for sale after Easter. The sale ran in conjunction with our 2nd year Parent/Teacher meeting The following school departments were among those involved in creating produce for the sale: Home Economics, Woodwork, Metalwork and Art. It was a very successful evening. The Parents' association will also have a bag packing day in Dunnes Stores on March 9th from 09:00 to 16:00. They will be helped out on the day by the Leaving Cert applied students from 5th year. Come support us on the day! ​The Parents' association will be attending a Cookery Demonstration in the IVY House Cookery School on Friday morning the 17th of February. They will also be going on a trip to the Dail on Tuesday March 28th. 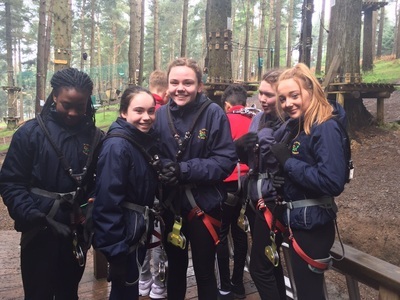 LCA VPG task day!The LCA 5th years completed their VPG task on Valentine's Day -14th February. 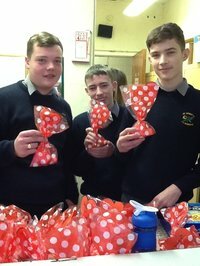 Their task involved selling and delivering bags of jellies for Valentine's Day. 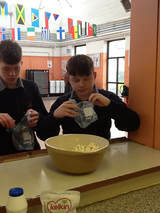 The bags of sweets cost €1.50 per bag and all money raised will be donated to Pieta House. Operation Transformation St. Conleths style. Teachers, students and SNA's will over the next few weeks be training to be able to complete a 2.5k run. All those interested will be training on Monday and Thursday lunchtimes. Congratulations to Israel Abgetuyi in 2 G who has qualified for the national final of the Bebras challenge. 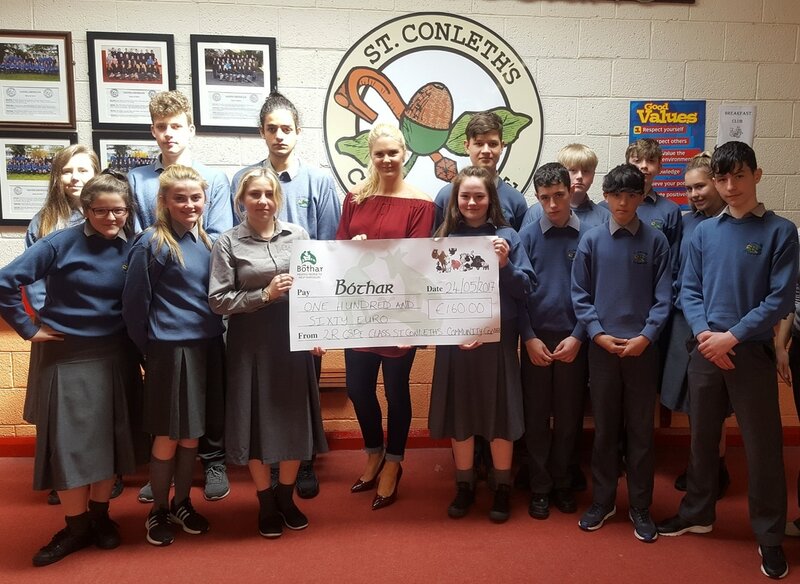 85 students in total from St. Conleths CC took part in the challenge.The Bebras® Computing Challenge introduces computational thinking to students, by allowing them to solve interactive tasks online. It is run in over 30 countries and takes place every November. The tasks can be answered without prior knowledge about computational thinking or information and communication technology. The aim of Bebras is to get students all over the world excited about computing. Israel won the school challenge and achieved one of the highest results in Kildare. Israel will now go on to compete in the national Final on April 22nd. Congratulations to Caoimhe Gately who appeared on RTE's 'Today with Daiti and Maura' as a part of Brenda Donohoe's interview with the Newbridge Panto group (The longest running panto in Ireland). 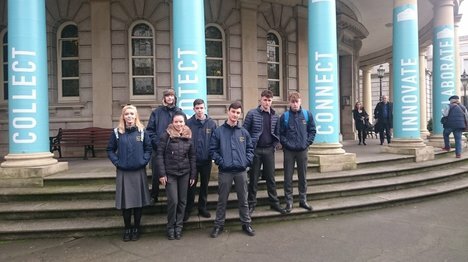 The 5th Year history class travelled to Dublin on 17 January to attend a workshop at the National Library of Ireland on Kildare Street. The students were shown how to search for the historical sources which are available in the National Library. They also gained an insight into how historical sources can be interpreted and evaluated. These skills will help the students to complete their research studies for the Leaving Certificate. The class also visited the GPO on O'Connell Street before returning to Newbridge. A group of Leaving Cert students along with their Biology teacher headed off to Maynooth University on Wednesday January 18th. 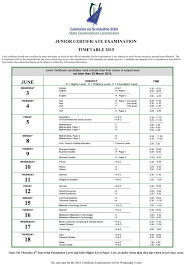 This practical day covered Leaving Certificate Examination experiments for revision purposes. They also give the 6th years an insight into student life on campus. The student council have reopened the school shop. The school shop allows students the opportunity to purchase healthy snacks and some school supplies. It is open every day from 11 o'clock to ten past 11. There is a rota that sees all student council members running the shop. 5th years have just finished training with the Bank of Ireland school bank program. 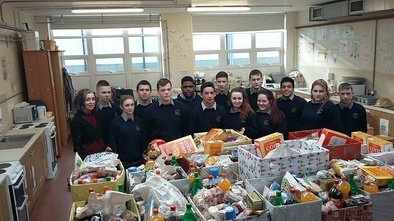 It is hoped that very soon students from St. Conleths will be able to do Bank of Ireland lodgements in the school at lunchtime. The 2R CSPE class will be having a speaker in to talk to them for their CSPE project. The speaker will be giving information about the lives of refugee and asylum seekers. Business Link interview skills workshops and interviews will be run with the help of P&G Newbridge. 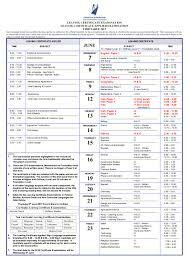 Night classes begin at St. Conleths in the week of Monday the 30th. For more information, click on the following link. St Conleth's U14 footballers travelled to Meath on Friday 15 September along with Mr Evans and Mr Whyte. St Conleth's had a big win in the opening match of the North Leinster Blitz against St Farnan's of Prosperous. This was followed by a defeat against an excellent Scoil Mhuire team from Clane. St Conleth's bounced back in the final match of the day with a fine team performance in a close match against Beaufort College of Navan. The winners of the Positive Mental Health competitions were presented with their prizes this week in school. The poetry and art work of the students can be viewed below and is also on display on the Positive Mental Health notice board in the main hall of the school. Congratulations to all students who entered the competitions, as it was a very tough decision to choose a winner from such fantastic poems and posters. Is there a point in starting again. For anything to believe in. I start to see what most people see. The girl who never gave up. You are perfect the way you are don’t let anyone tell you otherwise. If its from zero to square one. Being you is just fine. As a part of their Horticulture class with Ms. McEvoy, the 5A class have each designed a 'Relaxation Garden'. These designs are on display on the notice board outside room 13, for any future landscape designers looking for ideas. The students were inspired by the winner of the 2015 Bloom festival Niall Maxwell who designed a garden for Pieta House, themed on their Darkness into Light campaign. The 5A class completed this work for their General Education Task in conjunction with Positive Mental Health week in the school. Congratulations to Vanessa Collins (3G) who won the 'Guess the Teacher' photo competition with 8 out of 15 correct answers. Vanessa was presented with her prize of a Whitewater shopping centre gift card by Donell Saramaya in 5A who was part of the team who organised the competition. Well done to all of the students who entered the competition. The correct answers are now on display on the Positive Mental Health notice board. Looking for some new songs to download? Tired of listening to sad, negative songs? Why not listen to this playlist of Positive Mood Songs compiled by the 5 Applied class for Positive Mental Health week. These songs are assured to make you feel more positive and energized! As a part of Positive Mental Health week, the 5 Applied class have created recipes using "Good Mood Foods". 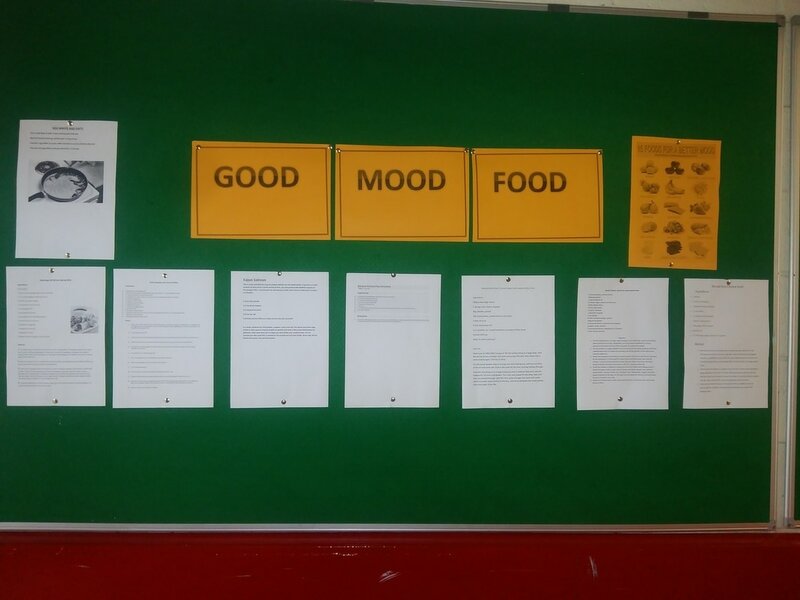 In their Hotel, Tourism and Catering class with Ms. Kingston, the 5A class researched what foods make us feel more positive and designed recipes based on this. 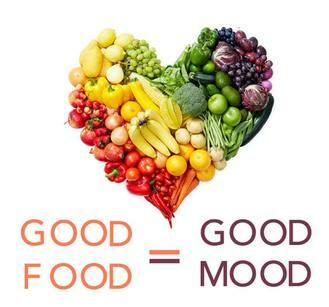 If you would like to know more about "Good Mood Food" please see the notice board outside room 13. This week (Monday, January 16th to Friday January 20th) the 5 Applied class are organising a Positive Mental Health week for the school. 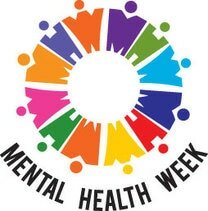 You may notice posters and information about positive mental health on the school noticeboards, in the classrooms and here on the school website.ALL students are being invited to participate in 3 Positive Mental Health competitions that are taking place this week. Poetry Competition: Write a poem, 3 stanzas long or more on the topic of positive mental health and give it (on a sheet) to a member of the 5A class or Ms. Whelan before Friday, January 20th. The winning poem will be published on the school website as well as being given a prize. Art Competition: Design an A4/A3 sized poster about Positive Mental Health and give it (on a sheet) to a member of the 5A class or Ms. Whelan before Friday, January 20th. 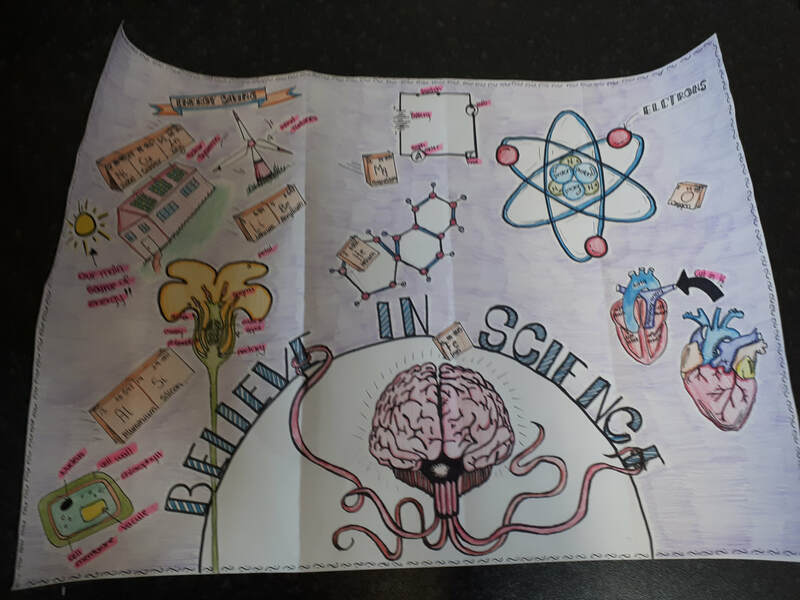 The winning poster will be published on the school website as well as being given a prize. ‘GUESS THE TEACHER’ Competition: All week long at break time, the 5 Applied class will be accepting entries for the Guess the Teacher competition. 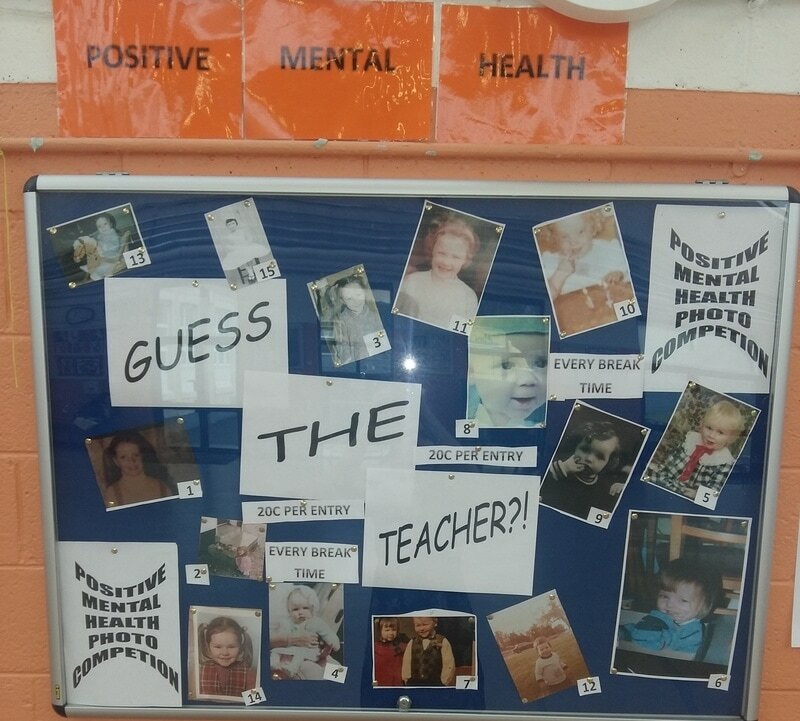 On the Positive Mental Health notice board in the main hall of the school you will see a series of photos of some of the teachers when they were much younger. For 20c per entry you can write your guesses on a sheet and give it to the 5 Applied student working at the PMH board that day and you could be in with the chance of winning a Whitewater Shopping Centre voucher! Best of luck to all of our competition entries and enjoy the week! 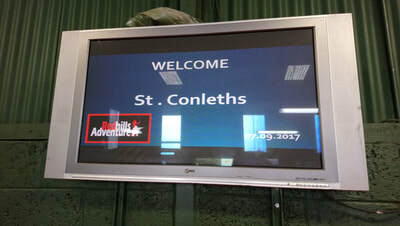 St.Conleths will be running night classes for the new term from Wednesday the 29th of Janruary. thanks to all the parents who attended a recent talk on Positive Mental Health in St. Conleths Community College on Tuesday the 13th of December at 7:30 pm. 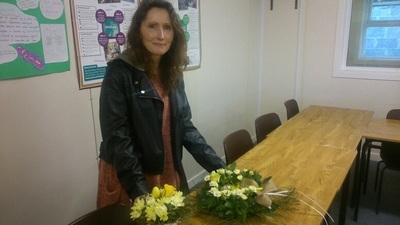 The talk was given by Clare O'Brien from the organisation 3T's- Turn the Tide of suicide. 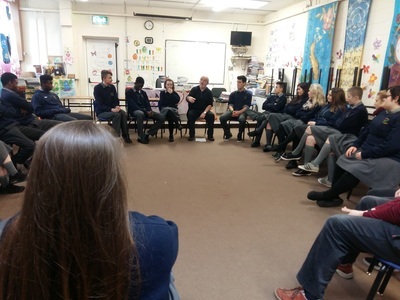 Our 6th Year and 6th Year applied attended a talk on the 12 of December by KYT called Building Resilience. 2. Have a Sense of Purpose. ​Below are photos taken during the KYT session. 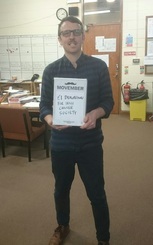 and donated by individual donations of €1 for staff and 50c for students. This money went to the Irish Cancer Society Reearch on behalf of St.
Holding our cups of hot chocolate. We light all the candles. I am going to drop! Its also a time to know why you’re living. Be careful not to get them eaten by a mouse. Especially your favourite chocolate cake. Also to know he saved all of us. 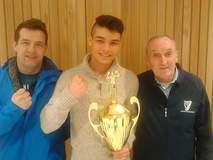 Cornel Micusa, 5th year, recently had success as part of the Leinster Boxing Development Squad. Cornel won his two bouts (against Belarus and Poland) to take the Gold medal in his weight and also picked up the Best Away Boxer prize in a tournament involving boxers from Poland, Ireland, Germany, Belarus and others. 5th years presented 2 cheques today to charity. 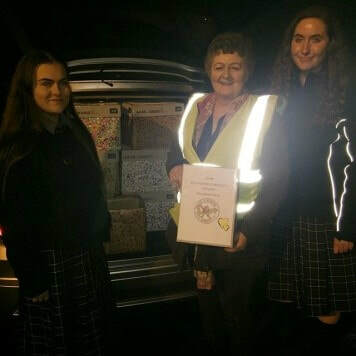 Sandra a Pieta House representative and Nancy from the Irish heart Foundation collected the cheques. 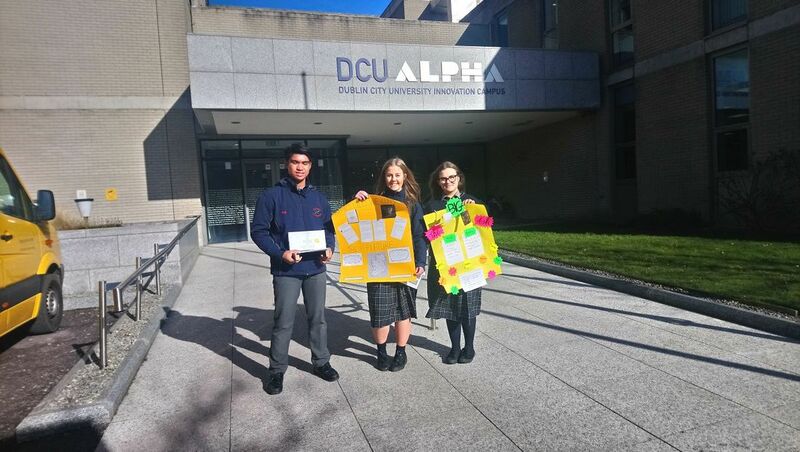 €660 was raised in October from student and tecaher donations for a fancy dress day. Each organisation got €330 each. 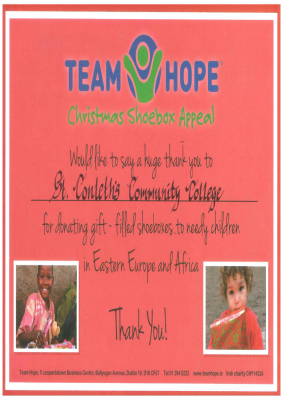 Thanks to the kindness and generosity of our students and staff at St. Conleth’s CC, a great number of shoeboxes were created for the Team Hope Christmas Shoebox Appeal. After a fundraising day in the school, the shoeboxes were filled with a range of simple Christmas gifts and dropped off at our local drop off point, in time for people in need around the world to receive and enjoy them this Christmas. Team Hope have “over the last eighteen years […] delivered […] shoebox gifts to over three million children, to some of the remotest and poorest parts of the world. To children who think they’ve been forgotten, […] kindness shows them they haven’t been”. Team Hope were very grateful for the school’s contribution to their appeal this year and presented the school with a certificate for our efforts, which is displayed with pride in the school. First years take part in a study skills workshop. Under 14 Boys play football against the Patrician Brothers School. Well played by both teams. Science week Ireland takes place this week 13th - 20th of November. Students are encouraged to take part in activities, eg Making a poster with Title Science RIsing or Solving the daily Science puzzle. 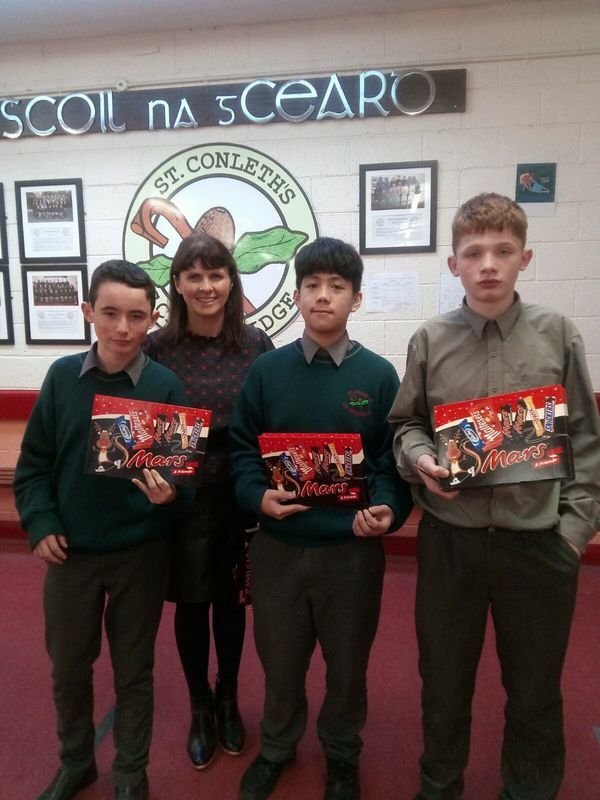 Students from St. Conleths headed to Carlow IT for a recent Open Day. From the week of November the 21st, St. Conleths celebrate College Awareness Week. Conratulations to all those who won prizes for their Science posters. 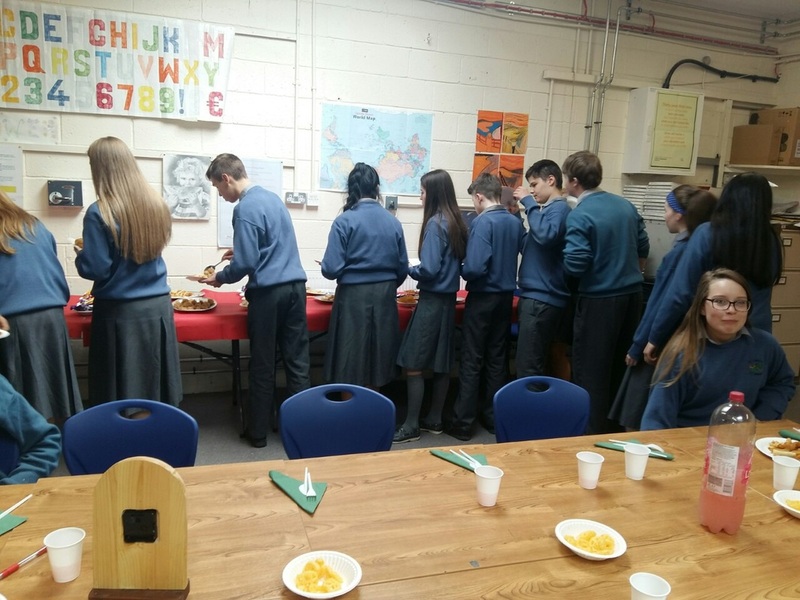 St. Conleth's CC Parents Association, in conjunction with the HCSL, organised an International Food Day which took place on Thursday the 17th from mid day to 2pm. 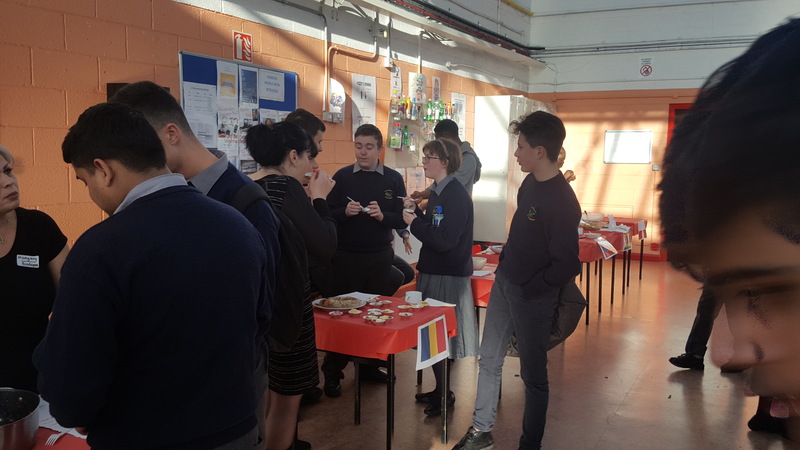 This celebration was organised to highlight and recognise the 30 different nationalities attending our school, we celebrated with cuisine from all around the globe. Participants were encouraged to dress in a traditional costume for the event. It was a spectacular display of colour, taste and international culture. The tastes were savoured by the media, visiting chefs, parents, teachers and students. As a result, we are intending to produce a cookery book of all the different recipes and have it for sale as a fundraiser for the school. 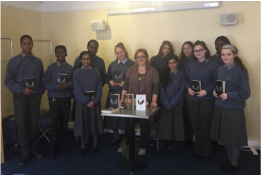 First and second year students were delighted to attend a visit to Newbridge local library for a visit from Irish author, Ruth Francis Long. On Thursday 20th of October a group of twelve students spent one hour with the author learning about the process of creative writing. Ruth’s book, A Crack in Everything, was read and well received by all of the students. During the visit Ruth explained the process and work that goes into creating and publishing a book. She answered questions from the students and explained in great detail the importance of storytelling. Much of Ruth’s inspiration comes from Irish folklore. Ruth was extremely warm and receptive and many of the students found her words of advice inspirational. Students would highly recommend the book and would like to thank Newbridge Library for extending the invitation to them. 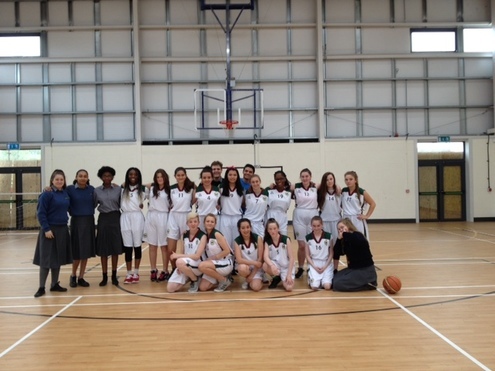 Congratulations to the U19 girls basketball team in their victory over Oaklands Community College, Edenderry on a scoreline of 46 points to 25. A new Wednesday club is up and running. Mr. Kelly's Architectural Model making is on from 13:30 to 15:00 each Wednesday for those signed up. This club joins the long running Wood turning club which is run by Mr. Emmet Kane. Maths Week is being celebrated in St. Conleth's with various activities from poster competitions, to Maths Eyes competitions, maths I.T. classes, daily Maths puzzles and more. For information on Maths Week Ireland click on the following link. 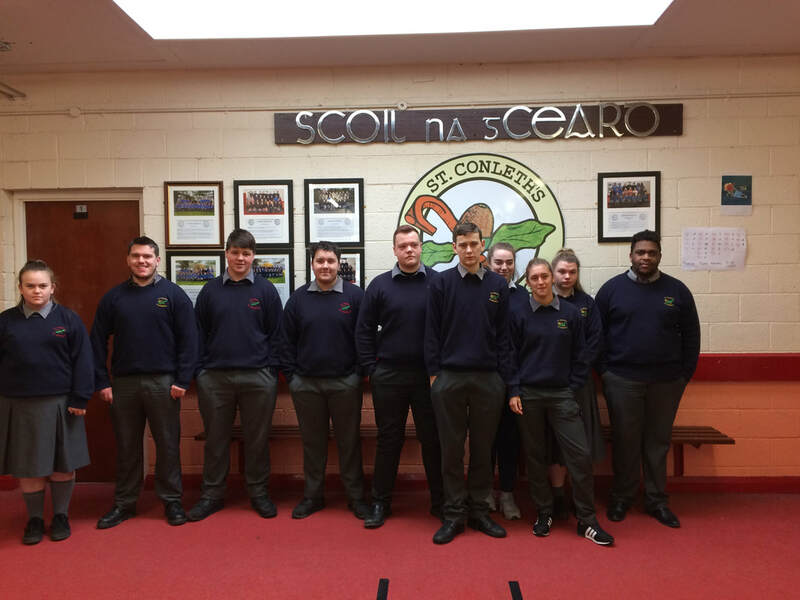 St. Conleth's Community College have 8 students involved with Comhairle na nOg and will attend a meeting on Wednesday the 19th in Clane. JCSP activity. The JCSP students in St. Conleths will be going on an outing to Kbowl on Friday the 21st. Guest Speaker. A guest speaker, from DCU, will be coming to talk to our 5th and 6th year students on Thursday the 20th. A group of Second Years will be enjoying a trip to the Library on Thursday the 20th. Sports: Under 14's Gaelic match takes place on Monday the 17th and an Under 19's Girls basketball home match against Kilbeggan takes place on Thursday the 20th and an away match on Monday the 24th. Best of luck to all those involved. 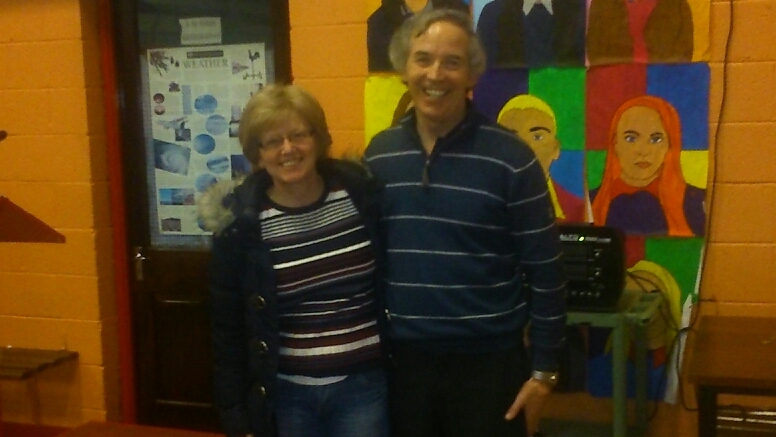 TD Fiona O' Loughlin came to visit 2B CSPE class on Friday the 14th. The German school trip takes place from Thursday the 27th. Comhairle na Nog are running a photo and Art competition, with a Positive Mental Health theme. All interested students should have work entered by the 05/10/2016. Also the annual Photography and Art Competitions run by Mental Health Ireland is open for entries! It is time for any of our students out there to be involved. The theme for this year is ‘Mind Your Mental Health’. Although, these words form the theme, the words ‘Mind Your Mental Health’ does not need to be included these words in their entry but you are welcome to if they wish. For Art entry form and guidelines click on the following link. For Photo entry form and guidelines click on the following link. St. Conleth's Community College opened its doors on Thursday the 29th of September to perspective first year students. Students from our feeder schools attended during the day and parents of incoming students attended from 4:00 pm to 6:30pm to view the school and talk with both students and teachers. On Monday the 26th of September, The Under 19 Girls had their first basketball match of the season. The match was a home game and took place in the school's gym. The opponents were the girls from St. Mary's Secondary School in Edenderry. The match was hard fought with St. Conleth's leading the way through the match until the third quarter. The last quarter saw the girls play really well but unfortunately they were beaten by 1 point. Gaelic Football training now takes place Wednesday's for all years. Full gear is required. Under 16 and Under 14 panels for the year will be selected from the players at training. On Thursday the 6th of October the first of the Uner 14's Boys Gaelic Football matches takes place in Naas against Naas Community College. Homework Club will be available for first and Second year students from Monday the third of October. Homework Club will be available from 4:00 to 5:00. If you are a student and would like to attend, an application can be acquired from the school's office. 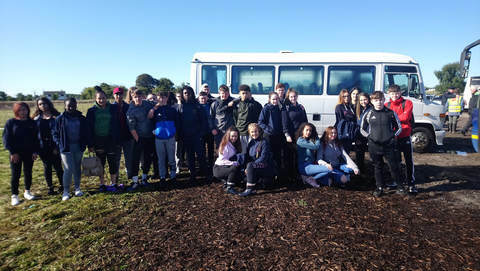 On Tuesday the 20th of September, the LCA 5 class along with Ms. McEvoy went to the National Ploughing Championships in Tullamore. This trip was organised as part of their Agriculture, Horticulture LCA class. On Thursday the 22nd of September, students are on the move to the Phoenix Park. 5th and 6th year Biology students will undertake a fieldtrip to the Zoo and Phoenix Park. The field trip is part of the Leaving Cert Biology Ecology field trip. Flora and Fauna were investigated and collected using various ecological apparatus. On Friday 15 September,St Conleth's U14 footballers travelled to Meath along with Mr Evans and Mr Whyte. St Conleth's had a big win in the opening match of the North Leinster Blitz against St Farnan's of Prosperous. 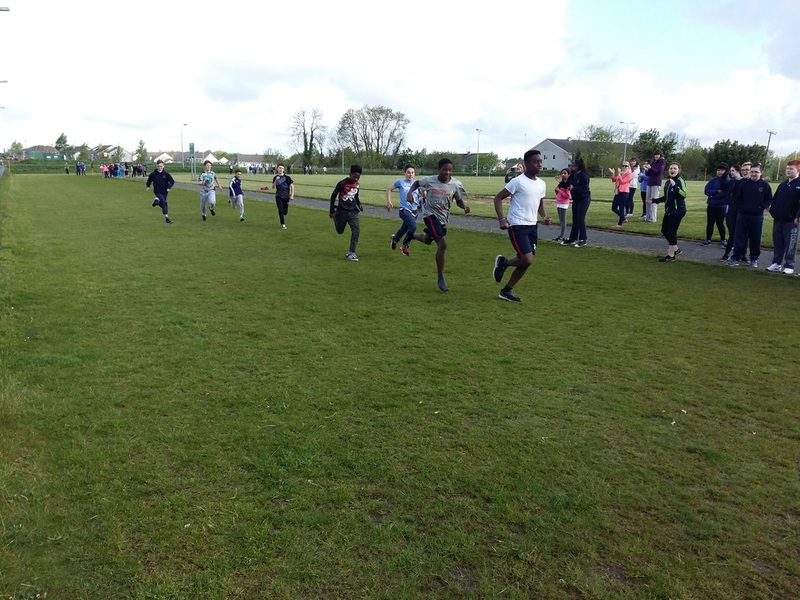 This was followed by a defeat against an excellent Scoil Mhuire team from Clane. St Conleth's bounced back in the final match of the day with a fine team performance in a close match against Beaufort College of Navan. ​Best of luck to Mr. Quille who is due to present his research at a conference at the University of Cambridge, England this weekend. Mr. Quille who we know as the teacher of Science and Physics and tutor of Computer Science in the further education college is currently completing his PhD at Maynooth University. The conference entitled ‘Psycology of Programming Interest Group’ (PPIG) is part of an ‘IEEE Symposium’ on Visual Languages and Human Centric Computing. 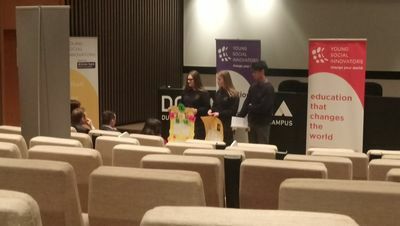 Mr. Quille’s paper which he will be presenting is entitled “Programming: Further Factors That Influence Success” and was supervised by Dr. Susan Bergin, a lecturer at Maynooth University. The paper explores factors to predict student success on an introductory programming module. Basketball for all students begins next week, from the 12th of September. 1st Year Boys and Girls will have their sessions on Mondays in the gym after school. Girls from 2nd year and upwards have their session in the gym after school on Tuesdays and Boys from 2nd year and upwards have their session in the gym after school on Thursdays. Gaelic Football, Hurling and Soccer training for 3rd, 5th and 6th Years will take place on Fridays @12:30pm and for 1st and 2nd on Thursdays @ 12:30pm. All those interested should bring their outdoor gear and their gumshield as without this you will not be allowed go training. Science club takes place weekly in Rm 18. All interested are invited to come along. Reading Room- the reading room is open every Tuesday and Thursday lunchtime from 1:30pm. All welcome. Games Club is open every Thursday at lunchtime from 1:30pm. All welcome. We are collecting tokens for a free weather station,tokens are published everyday in The Irish Mail and in The Irish Mail on Sunday. Students who bring in the most tokens will be in line for a prize. Parents of new First Year students who have already paid the school charges can collect books for their core subjects and school jackets in St. Conleth's Community College on Tuesday, August 23rd between 11am to 1pm. Parents/Guardians with existing school charges can also be pay at this time. ​First Years will start school on Thursday August 25th. They will be in school from 9am-12.30pm only on this day. PLC students for the academic year 2016/2017 will begin on the 1st of September. Click on the following link to find out more about all our Plc classes. 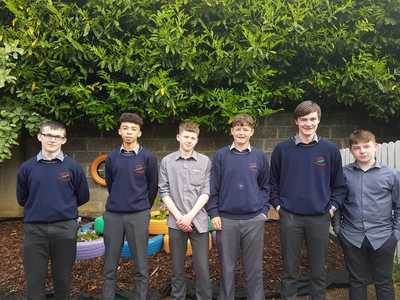 ​Bank of Ireland School Bank Winner Announced! 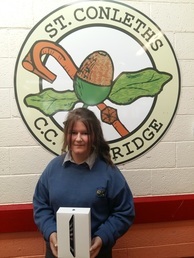 Congratulations to Amy Buckley from second year in St. Conleth's CC who is the winner of the Apple iPad mini this year. Each student who opened a current/savings account in the school Bank of Ireland was entered into a draw to win this prize. There was much anticipation this year as to who the lucky winner would be. Every student could deposit their savings into the school bank, each week and they all received a debit card to access their funds, outside of school. The 5th year Link Modules students acted as bankers, supervised by staff from Newbridge Bank of Ireland. ​Nathan Hennessy from second year in St. Conleth's CC has received a special commendation from the Cecil Day Lewis Competition this year. Nathan's story "The Mysterious Box" received special recognition from the committee, who receive hundreds of entries each year. Cecil Day Lewis was a poet and Poet Laureate in the UK, and father of the actor Daniel Day Lewis. Tyann Lee Kelly in first year also received recognition for her poetry entry this year. The Science Department Launch Bottle Rockets! This week in the science department they took advantage of the fantastic weather and ventured outside for an experiment which would be not be possible indoors (see video). The 2nd year science students conducted an experiment on pressure, mass, compression and friction, with the assistance of their teachers Mr. Quille and Mrs. McMahon. A water rocket is a type of model rocket using water as its reaction mass. The rocket is typically made from a used plastic soft drink bottle. The water is forced out by a pressurized gas, typically compressed air. The students experimented with various sizes of plastic bottles, with the highlight of the day being the largest bottle (a water bottle from the staff room water cooler) which can be viewed in the following video. *NB* This experiment should NOT be conducted without the supervision of an adult. 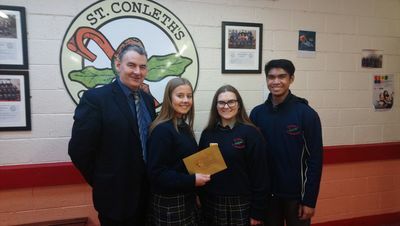 Phil Dunphy presented an Education Bursary in memory of her daughter Sarah Dunphy , Rathangan to Marisa Clarke 6th Year, St Conleth's Community College , Newbridge. ​This Bursary is known as Sarah's Gift and was presented to Marisa at the annual school Award Ceremony for her hard work, determination and courage during her Secondary School Years. Graduations took place in St. Conleths Community College on Tuesday the 24th for PLCs and Thursday the 26th for Leaving Certs. 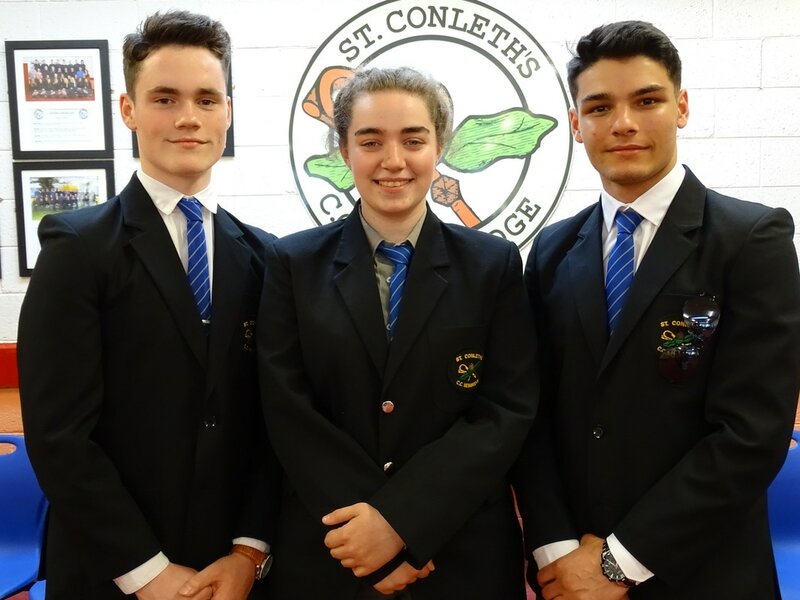 The staff at St. Conleths would like to wish the Graduates from both years the very best in their forthcoming exams and in their educational or workplace pursuits. 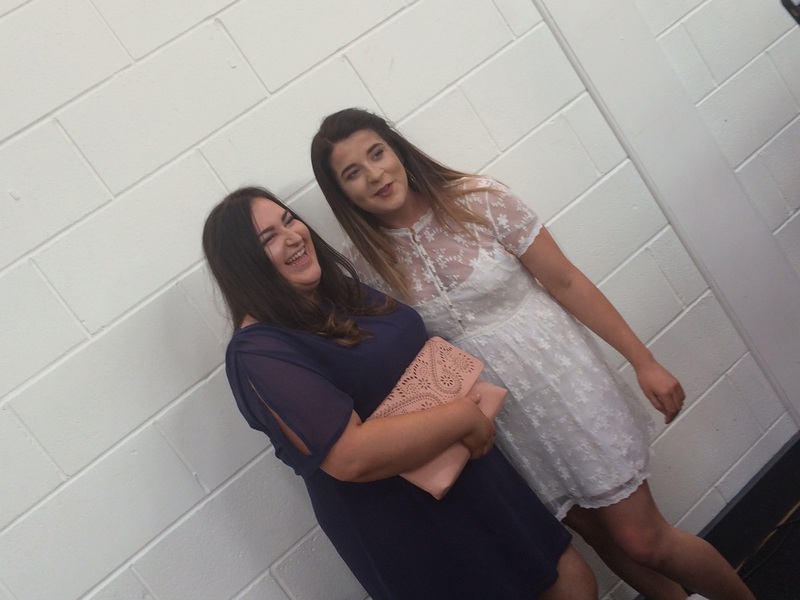 For more photos from the Leaving Cert Graduation, click on the following link. ​Mr. 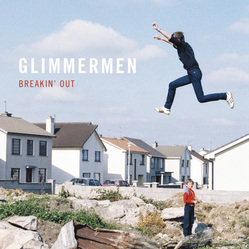 Cowley (Art and Music teacher) from St. Conleth's CC, also known as the lead singer/guitarist from the band Glimmermen has released his second album, along with his fellow band members. Following on from their first great album, "I'm Dead", Gimmermen's debut single "Bang" from the album "Breakin' Out" can be heard below. The album has also being reviewed in local and national media, as well as getting airplay in national radio. Click on the following link to watch Mr. Cowley perform the new Glimmermen single. We wish Mr. Cowley great success with this album release! ​Today the students of 2O participated in a Ramadan Fast for their school day. As a part of their Junior Certificate Religious Education journal work, the students studied the world religions Christianity, Judaism and Islam. The students were particularly interested in the Muslim festival of Ramadan which requires participants to abstain from food and drink from sunrise until sunset for 1 month. The students chose to do this activity for their RE journal, to experience in a small way, what Muslim people do for 30 days every year. After their fasting the students attended an iftar meal to break their fast together as a community. The students each collected sponsorship for this iftar themselves and were truly hungry by the end of the school day. 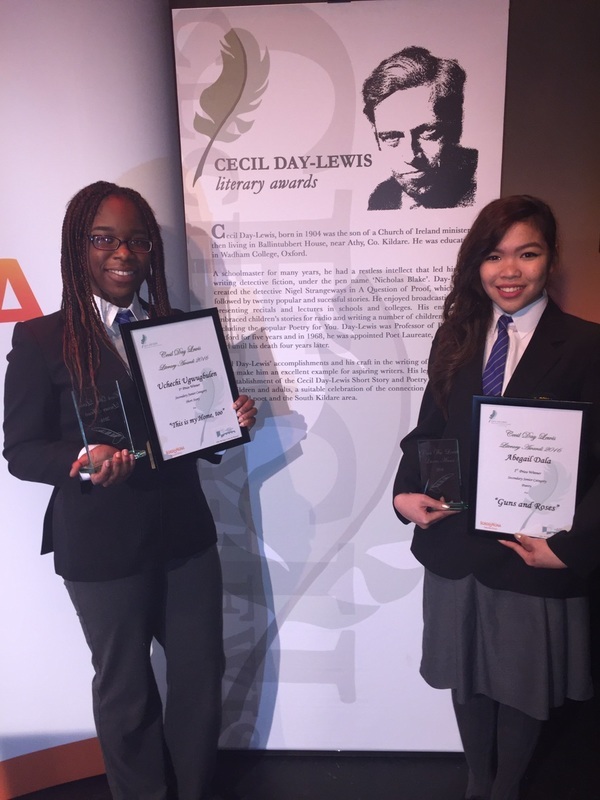 Congratulations to Abegail dala in 6th Year and Uchechi Ugwugbulem in the 2nd Year on winning prizes in the Annual Cecil Cay Lewis Literary Awards. Abegail took first prize in the Secondary Senior Poetry category for her entry "Guns and Roses". 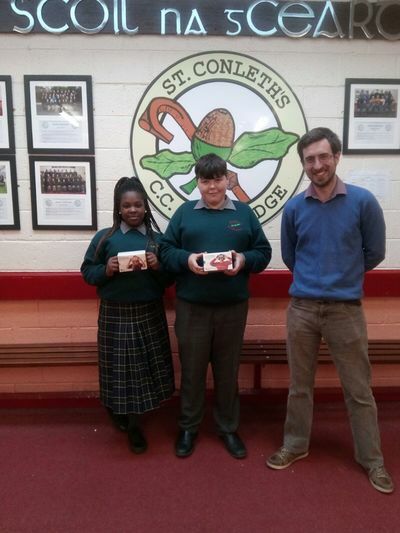 Uchechi all finished first in the Secondary Junior Short Story category for " This is my Home, too"
5th Year students sold brownies this week at lunchtime Tuesday. Money raised is going to the Alzheimers Society of Ireland. First Years along with Mr. Coleman went to Glendalough to take part in the annual Hike 4 Life fundraiser. 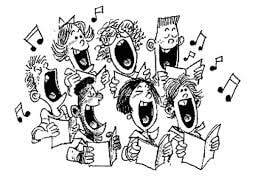 Solo singing practice for graduations takes place on Tuesday. Sports day took part on this week. 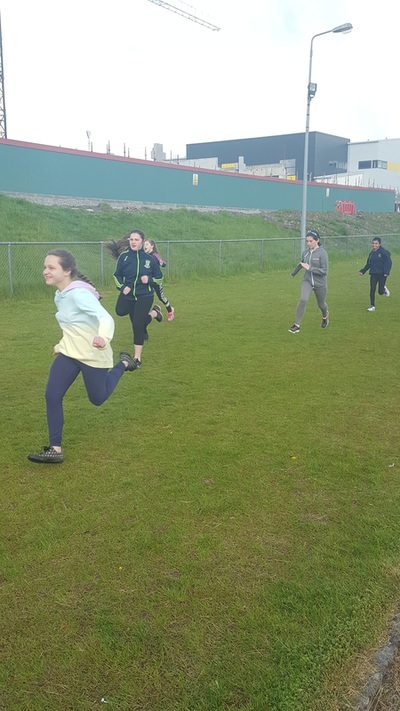 First, Second and Fifth Year students got to take part in track events which included Kick Fada, Poc Fada, Long Jump, High Jump, Shot Putt, Javelin and Running events. Indoor events included Soccer and Basketball. ​A big Thanks to Mr. Coleman for organising the day. 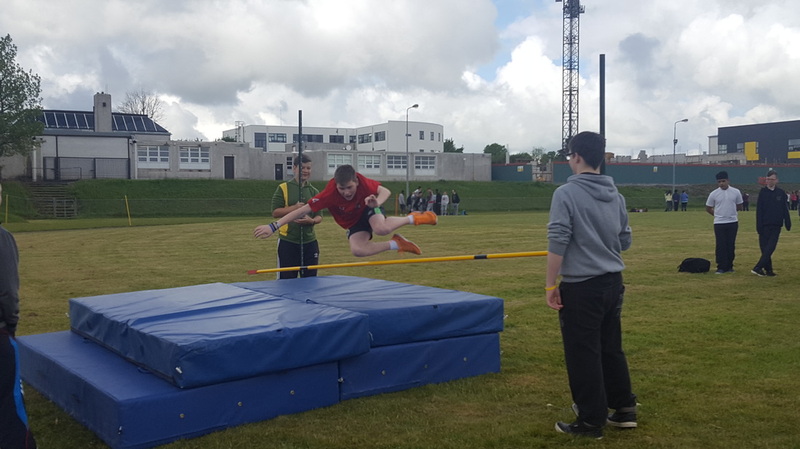 Here are a selection of photos from a very enjoyable sports day. 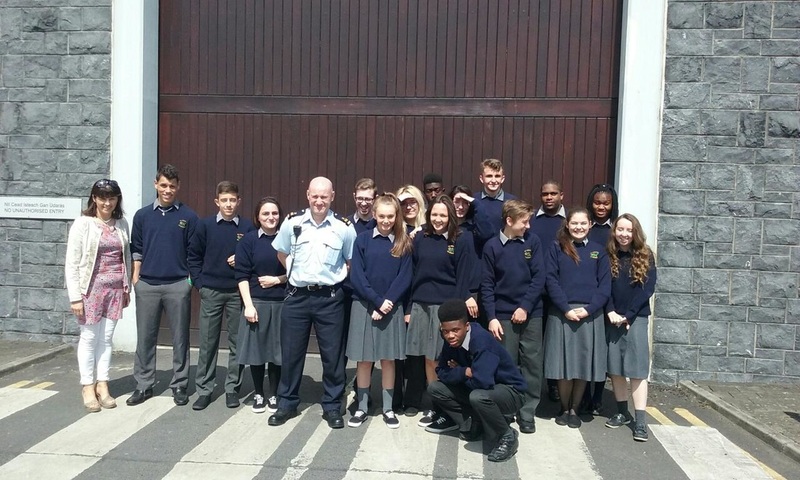 5th year students attended a tour of Midlands Prison in Portlaoise this week. As a part of their Leaving Certificate non exam Religious Education the students study a module entitled 'Crime and Punishment'. This tour was highly informative and at times shocking but invaluable for the students studies. 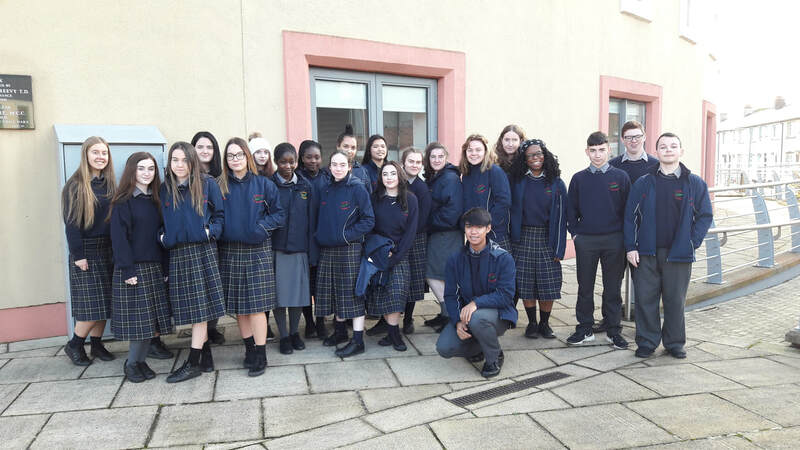 The students were accompanied by their year head Mrs. McMahon on the tour as a prison officer gave them a guided walk through the prison facility. 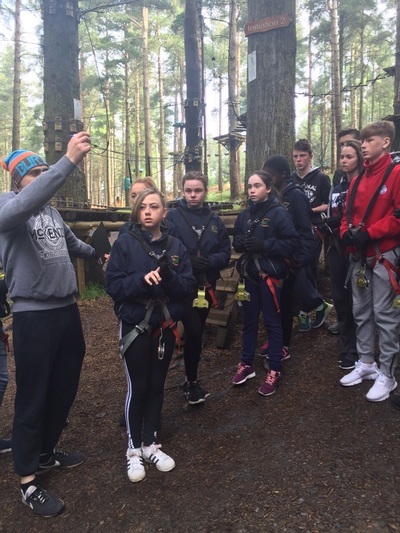 On Thursday the 12th, the second years boarded 2 coaches and headed for Tibradden Wood in Dublin. 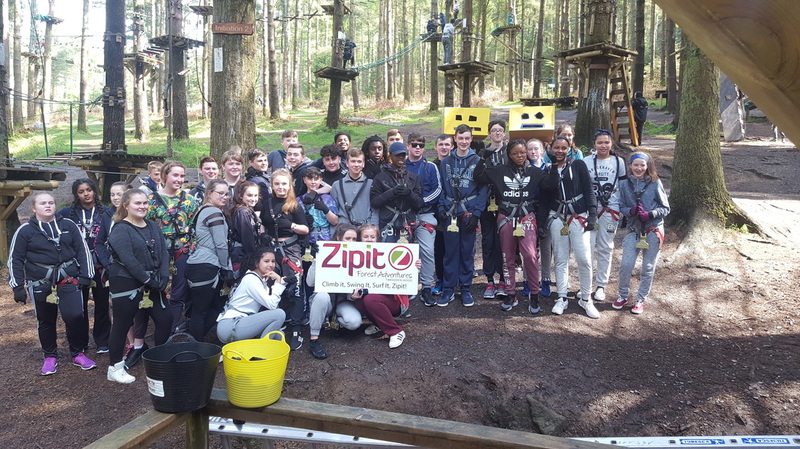 The venue was ZIPIT Forest Adventures. 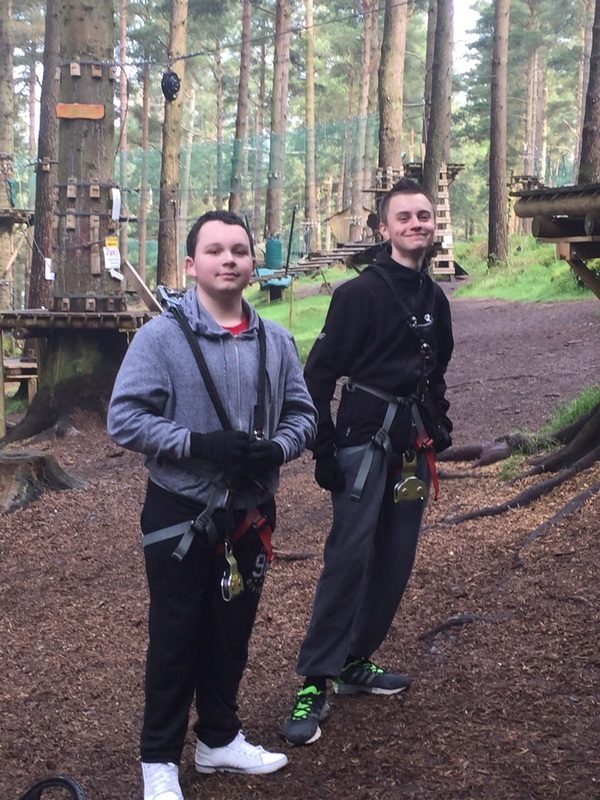 There the 2nd years got to go on many of the 650m of zipline. Few managed to make it through the Blue Circuit which is 135m, the highest point on it about 13m. Take a look at the photos below to see how everyone got on. On Tuesday May 10th the students of 1st and 2nd year were treated to a dramatic production by the Limerick based theatre group ‘Humourfit’. 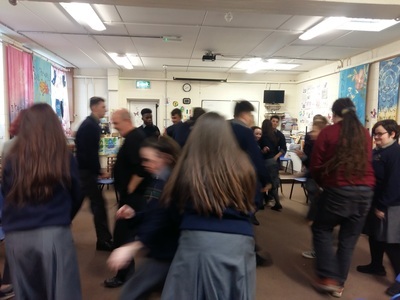 Michael O’Sullivan from Humourfit writes, produces and performs plays in schools on topical social issues, in conjunction with the student’s SPHE (Social Personal Health Education) studies. 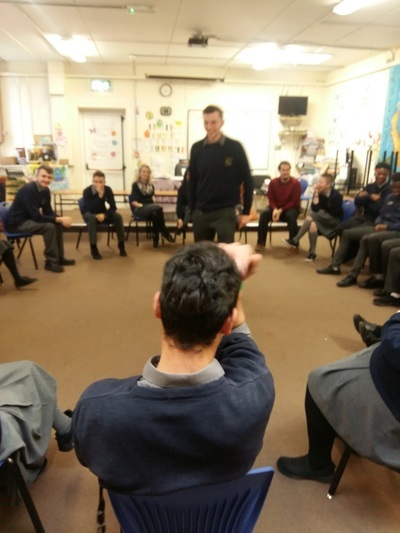 Topics explored by Humourfit include racism, alcohol and drug abuse as well as road safety. This year’s groups enjoyed performances on the topics of Bullying (“The Mighty Bully Brady”) and Positive Mental Health (“The Value of Life”). Michael truly brought these serious topics to life, with a hint of humour, which the students all thoroughly enjoyed. We look forward to welcoming Humourfit back to our new school next year! ​St. 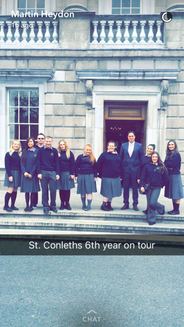 Conleth’s CC Leaving Certificate students visit Dáil Eireann on eve of the new government formation. 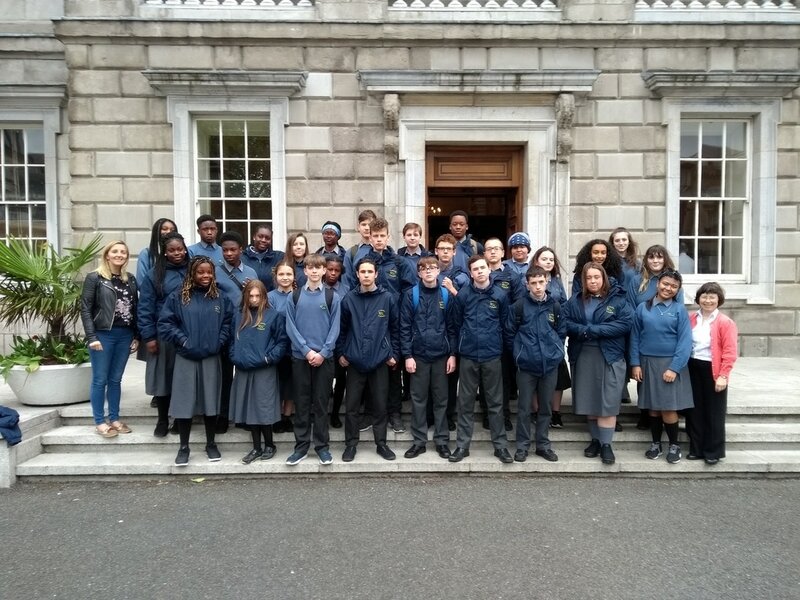 On Thursday May 5th, the students of Leaving Certificate Applied from St. Conleth’s Community College visited Leinster House in Dublin accompanied by their year head Mr. Coleman. The students were given a tour of the building, as well as been given the opportunity to watch a Dáil debate in session and ask any questions which they had related to their studies. 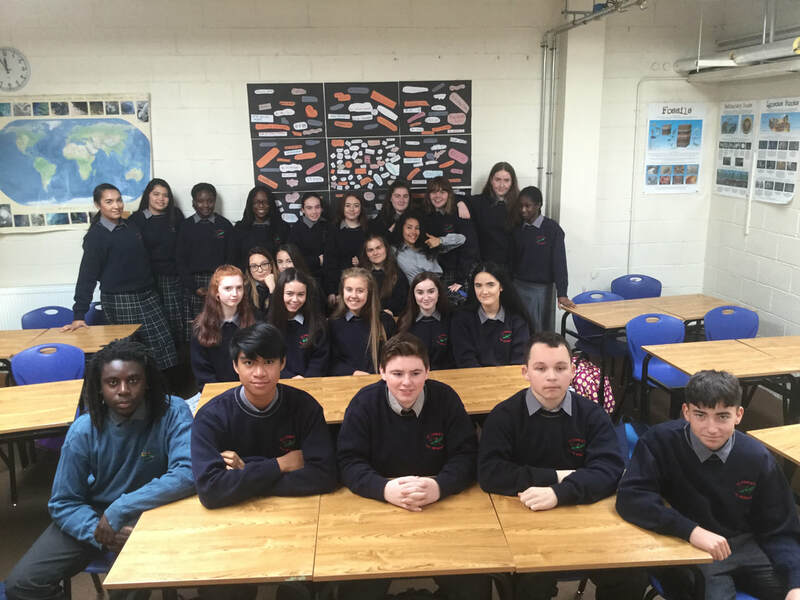 The students are part of a group studying Social Education for their Leaving Certificate, which will be examined in the coming weeks and they described the experience as invaluable for their exam. 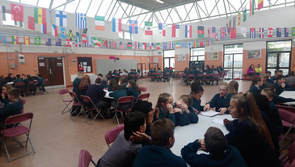 The students were particularly taken by the history of the building and in particular the Irish Proclamation which was explained to them in detail. 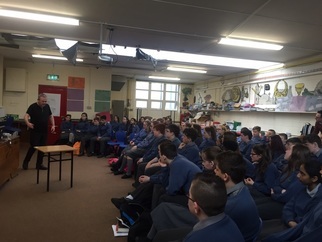 Local elected representative, Fine Gael TD Martin Heydon took time out of his busy schedule to greet the students and sit with them to answer their questions, explaining his role in the government and the community. The students were delighted to be able to have their photo taken with Mr. Heydon, as well as the odd “selfie”. 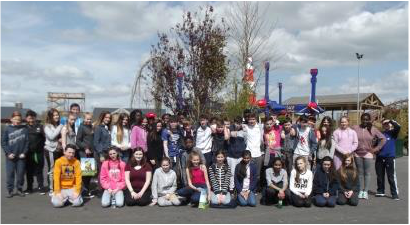 ​1st Yr students from St Conleths Community College went to Tayto Park for their annual school tour yesterday 5th May. The students were very lucky with the weather and enjoyed the various rides including the new Roller Coaster in the sunshine.They went on the Factory Tour and received a complimentary packet of Tayto crisps. Great fun was had by all. 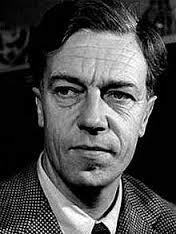 Entries are now being invited for the annual Cecil Day Lewis Competition Short Story and Poetry competition. 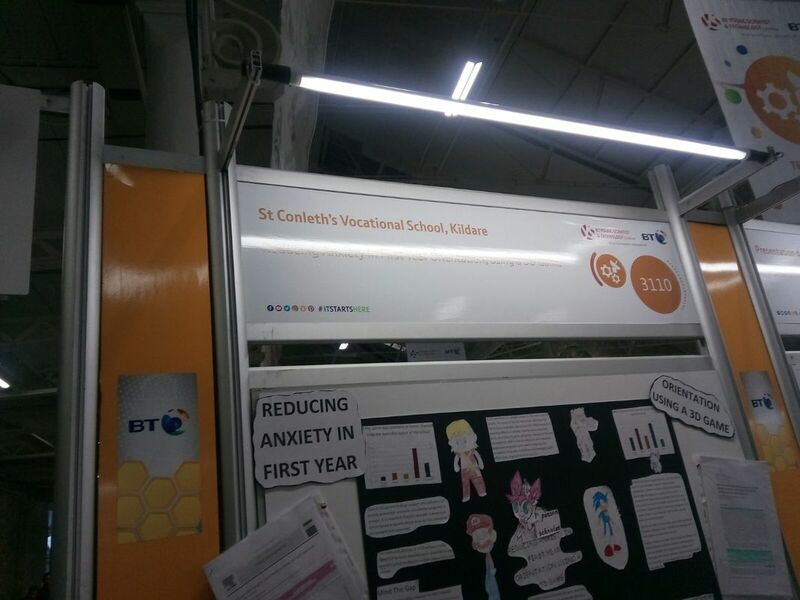 St. Conleths Community College have a proud history with this competition. The English department wish to invite all interested in the Creative Writing Competition to take part. 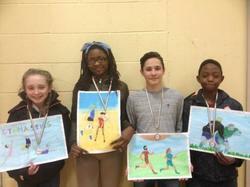 Fiyin Oluokun from 1 B won gold in the County Community Games Art Competition. Fiyin struck gold in the Under 14 category and will now go forward to represent Newbridge in the All Ireland Finals. Jessica Stirrat 1 Y took the 4th place medal in the same competition. The class of 2 B recently sold badges to raise money for the Kildare Animal Foundation. ​The badges are decorated with the Irish FLag. LCA 1 would like to thank everyone who supported their 7 C Cookies Enterprise. The profit made came to over €150 and this is being donated to the Irish Heart Foundation. 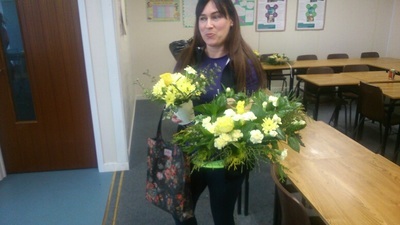 A very successful flower arranging class for parents was held in St. Conleth’s C.C. on March 18th. The facilitator was Adrienne Thompson from Kilcullen who did a wonderful job. Pictured here are Jacqueline Walker Browning (parent) with her floral display and Catherine Ayavoro (parent) with her display. 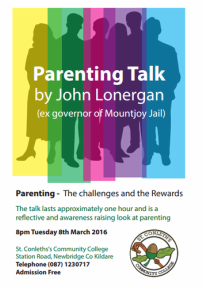 ​John Lonergan (ex-Governor of Mountjoy prison) gave a parenting talk in St. Conleth’s C.C on March 8th as a part of the school’s incoming first year evening. Mr. Lonergan has published a book on parenting, for which all proceeds go to charity. 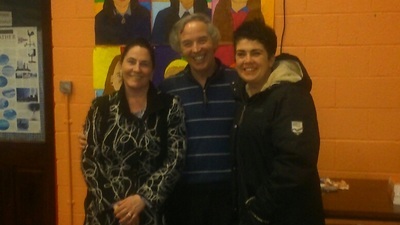 Pictured here are John Lonergan with Una Smyth (parent) and two other parents with Mr. Lonergan. A former student of St. Conleth’s CC Jasmine Kavanagh has succeeded in reaching the semi-finals of The Voice, under the tuition of Kian Egan(Team Kian). Jasmine was chosen by Kian after her performance of Beyoncé’s ‘Drunk in Love’ during the blind auditions. Jasmine will perform in the semi-finals this Sunday (April 17th) on RTE One. Jasmine’s other performances which included ‘Take Me Home’ by Jess Glynne and Adele’s ‘Hello’ were all very well received. We wish Jasmine all the best in her endeavours and will welcome her to the school if she ever wishes to perform here. VOTE Jasmine! The Second, third and sixth year students made the trip to Dublin on 11th April to complete the 1916 walking tour. Although the weather wasn't in our favour, the students were treated to an interactive experience, visiting the prominent sites during the rebellion. The tour was enjoyable as well as informative and a great day was had by all! 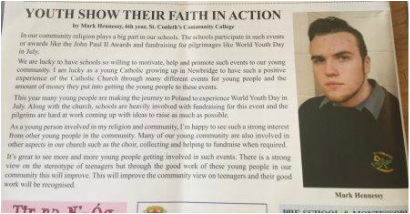 A 6th year student here at St. Conleth's CC has been published in the parish Link Up magazine, Easter edition. Mark Hennessy answered a request from the parish office to your school looking for budding young authors to write about their faith. So on top of Mark's busy Leaving Certificate studies he took the time to write the article, with his English teacher Ms. Talt's encouragement. 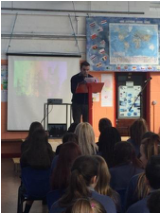 Mark is a higher level English student and it is no surprise that his article was well received in the school and parish communities. Students from St Conleths Community College took part in the Newbridge Community Games Art Competition recently. These students go forward to represent Newbridge in the County Final this Sunday 13th March. 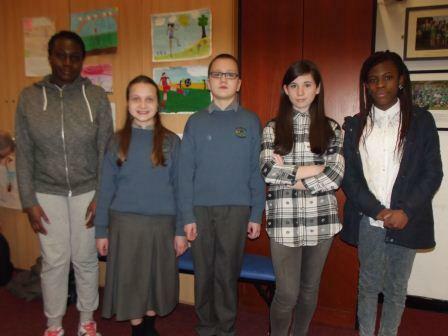 Cliona Feane Bracken, Teni Bada, Daniel Markevics, Matthew Ufumeli ​were also awarded medals for their artwork. LCA students recently sold cookie ingredients in a jar. 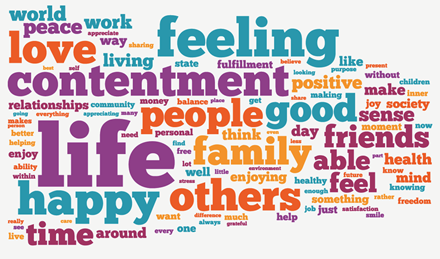 This was part of a task for their LCA course. All proceeds in aid of the Irish Heart Foundation. 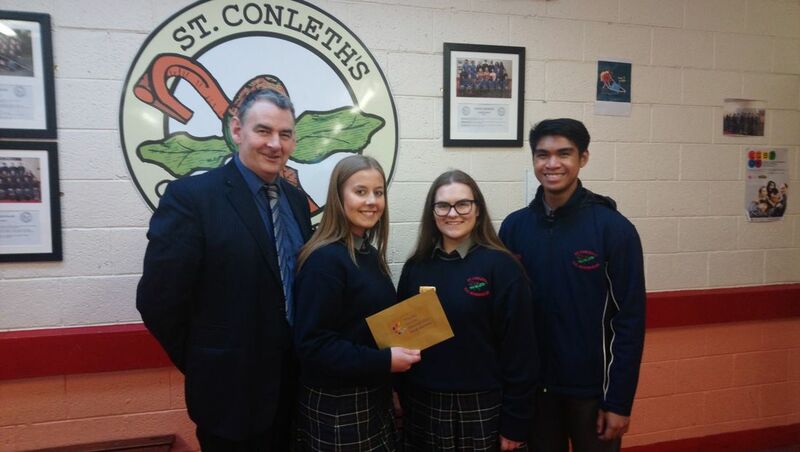 2nd Year students were given a chance to apply for a three week scholarship to the Gaeltacht. Application forms were available from Ms Lane and the interviews were conducted through Irish by Mr. Flannery. Congratulations to the three students awarded the the scholarship. John Lonergan( ex governor of Mountjoy). 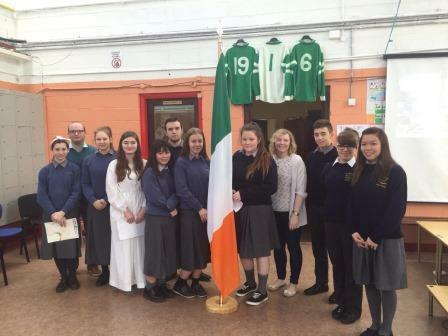 Recently students were invited to submit entries to a "1916 themed competition". 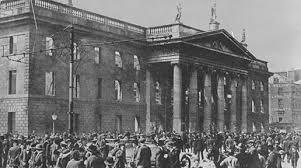 Students who were interested submitted a short essay entitled "What 1916 means to me". 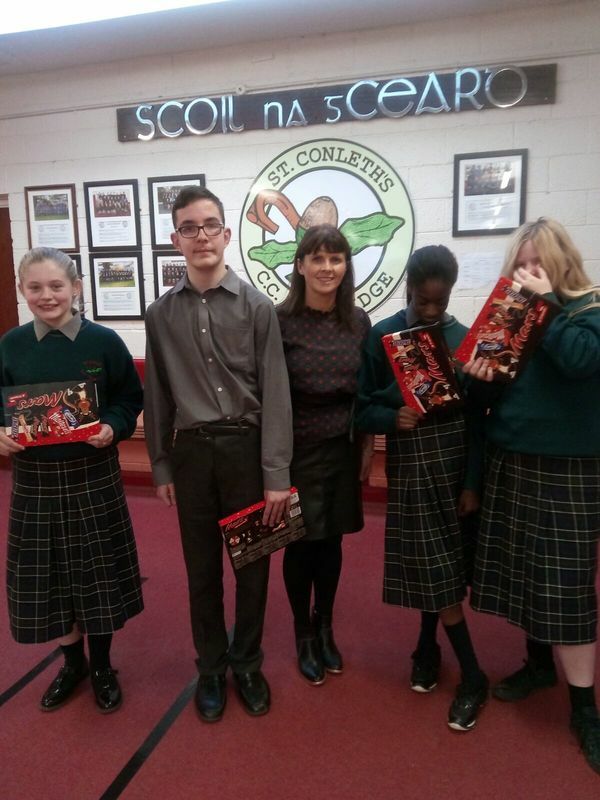 Entries were compiled by Ms O'Connell, Ms Kelly, Ms Thornton and Mr Evans before the lucky three students were announced. 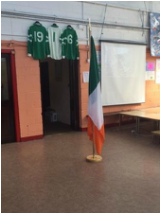 The three students with their teachers will attend the flag presentation ceremony in Croke Park, Dublin. This is a national flag presentation ceremony for post-primary schools. 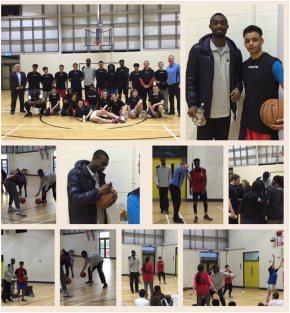 Students from the basketball teams in St. Conleth’s Community College were put through their paces at a special coaching session with premier league DCU Saints, (St. Vincents Basketball Club), players Duane Johnson (USA) and Pat Glover. The special session took place in the new gym facility at the school on Wednesday 24th February 2016 from 5 to 7pm. Students had the opportunity to work on their three pointers, slam dunks and layups under the watchful eye of their DCU coaches. It was a fast paced session with all students participating in the action. Not only did the students get to train with Duane and Pat, they also got to see Duane in action. Duane who is from the USA, is currently playing with DCU Saints and has played in Australia and USA also. It was physical evening but the students never lost their momentum as they moved from, offence to defence, rebounds to relays and lay-ups to turn-overs. Having put the students through their paces, Duane finished the session by delighting the small crowd by jumping over three students to perform a slam-dunk. DCU Saints Team Manager, Fintan Reilly, then presented Mr. Quille, the basketball coach and his players with T-shirts and water-bottles as momentums of the occasion. 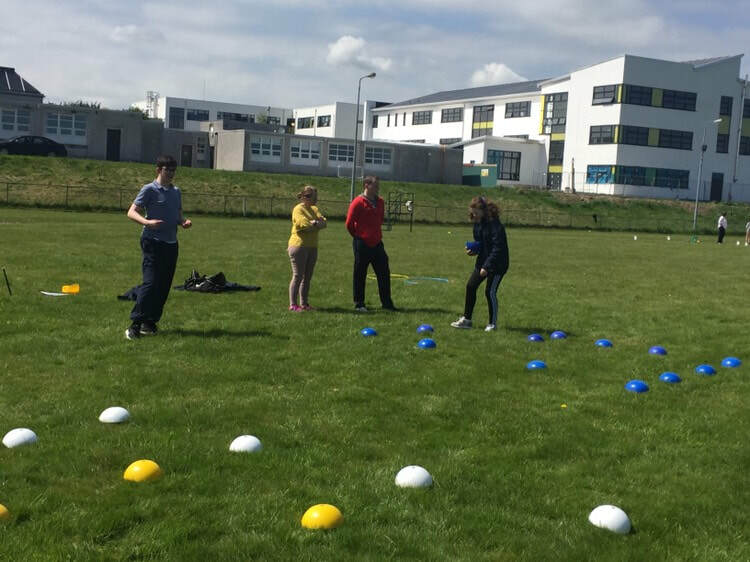 Mr. Quille, from St. Conleth’s said the students were extremely grateful for the time given by the DCU saints players and that the session was an ‘overwhelming success and will help improve and build on the solid skills the students have learned over the past two years’. 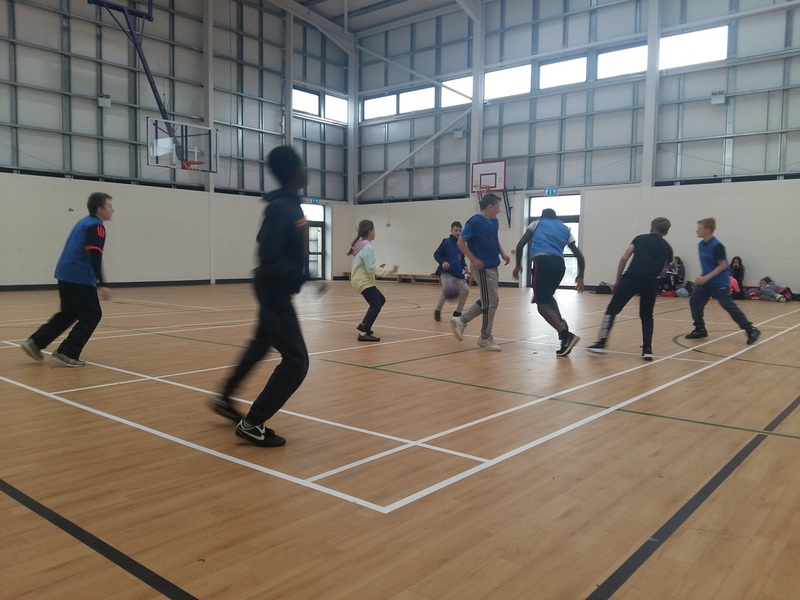 St. Conleth’s Community College Students put through their paces by DCU Saints Basketballers Duane Johnson (USA) and Pat Glover. 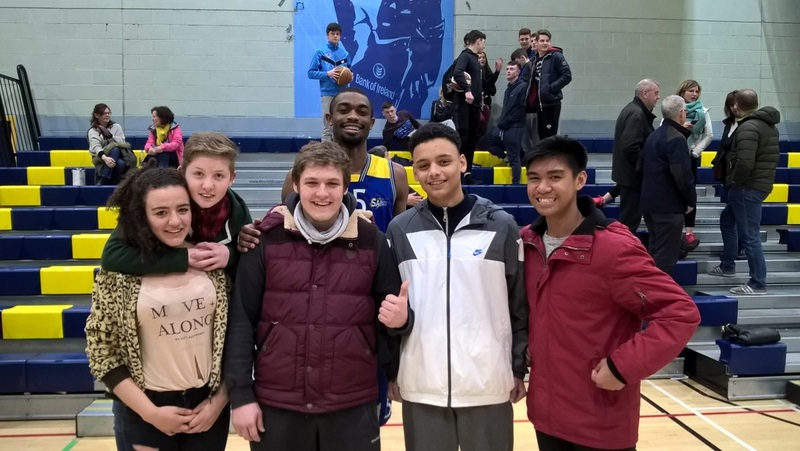 Taking time out from their mid term break holiday, a number of students travelled to DCU Sport's Campus to watch an All Star Basketball game. Accompanied by their basketball coach Mr. Quille, the students got the opportunity to view the game between DCU Saints and SSE Airtricity Moycullen Basketball Club. The game which was neck and neck all the way through was thoroughly entertaining, with DCU taking the lead in the end, for their final home game of the season. The students were welcomed to the arena by the commentator which the students couldn't believe. One of DCU's top players, Duane Johnson from America, came to meet the students after the game and give them some words of encouragement. He even posed for a photo, much to the student's delight. There will be a Technical Graphics Club at Tuesday tomorrow for any 1st, 2nd or 3rd year Technical Graphics students. 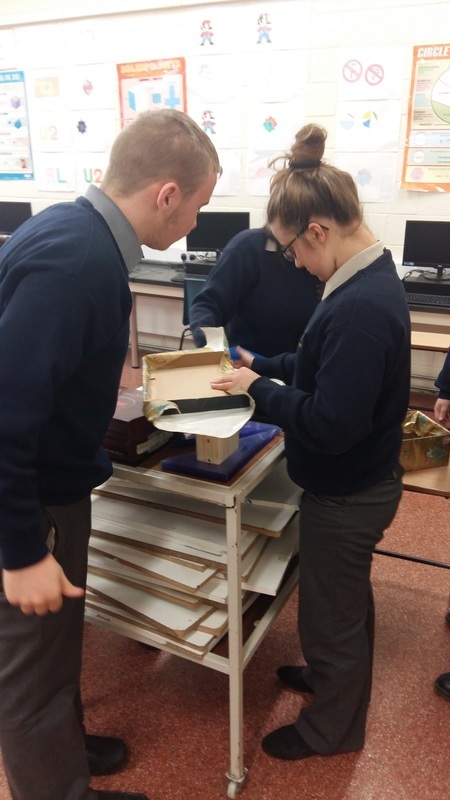 First and Second year students involved in the Woodwork workshop are reminded that classes continue at lunchtime on Monday. For further information, talk to Mr. Connolly or Mr. Kelly. 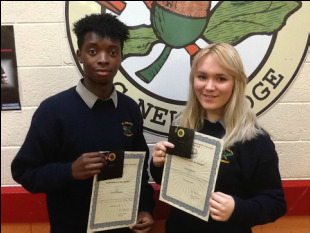 The presentation for the best Junior cert results from 2015 were awarded to Sara Kawa and David Mugalu. the presentation took place at the Annual mid year awards ceremony on the 28th of January. A presentation has being organised, in conjunction with the Parents Association, on Monday 25th January at 7:30 pm,for parents of St. Conleths Community College students, to allow parents to become familiar with techniques and skills your son/daughter will need for studying over their years in school. This presentation is free of charge, to parents of our exam students, and you are strongly encouraged to attend. Members of the Parents Association will be present on the night. The students of Third and Sixth year will have the opportunity to attend the "Study Focus" seminar on Tuesday 26th of January. 6th Year students are organising an indoor soccer tournament to start the week of the 25th of January. It will run on Tuesdays and Thursday lunchtime. ​Any student interested should register their interest before the tournament gets underway. The teams for the school indoor soccer tournament can now be seen on the school noticeboard outside the staff room. All students who signed up should check this as matches begin immediately. Students are reminded to bring appropriate gear for the sports hall. Under 14 and under 16 GAA training takes place every Thursday at lunchtime. We are extremely appreciative that former Kildare County footballer Tadgh Fennin visited us during training. 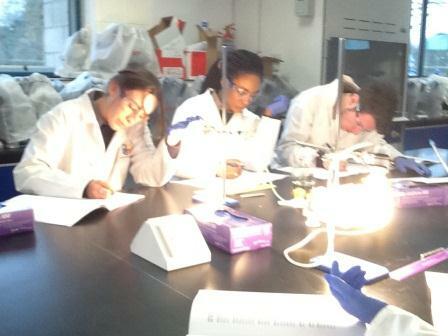 ​On Thursday 14th of Jan sixth year Biology students took part in a Leaving Cert revision day in Maynooth University Biology labs. 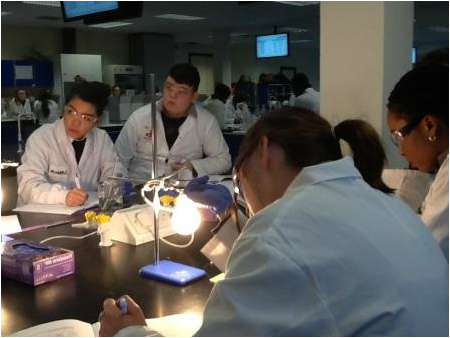 The labs are run by teaching technicians and post grad students in the university. 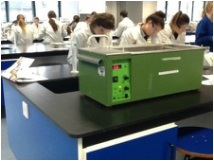 Students got a chance to revise experiments that are on the Leaving Cert course. They revised experiments and theory on various topics which should prove very worthwhile in preparation for upcoming Mock exams and State exams in June. 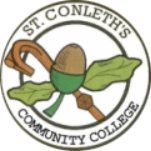 Click on the link below to find out about the night classes that are on offer at St. Conleths Community college for Spring 2016. From this link you will also find details for payment of course.